Happy to be headed home, but a little sad to leave the land of castle ramparts and lovely, friendly people. We are going through our social ‘exit process,’ which is much more pleasant than the bureaucratic one. We said good-bye to our beloved Starbucks buddies who presented us with a Starbucks Switzerland mug. Tomorrow we’ll say good-bye to the Lollipop girl who runs our favorite candy shop and who recently exposed her midriff to us to show a sweeping tattoo marking some Swiss legend that we could not understand. We also could not understand why a gal with such fabulous abs would want to colour over them, but that is the youth of today. Now if someone like me opted for a tattoo to visually sculpt my midriff into looking more concave and much less convex, that would make perfect sense. Calm down, Mom. I’m not going to do it. I said farewell to the most embittered glaring grocery store cashier who admitted I really wasn’t that much of a problem. I said so long over coffee and Swiss pastries to a Swiss/Afghani/Indian/American friend with communist sympathies and an adorable calico kitten, as well as her hockey-playing Swiss husband who mistakenly thinks the best team in the NHL is the Detroit Red Wings. 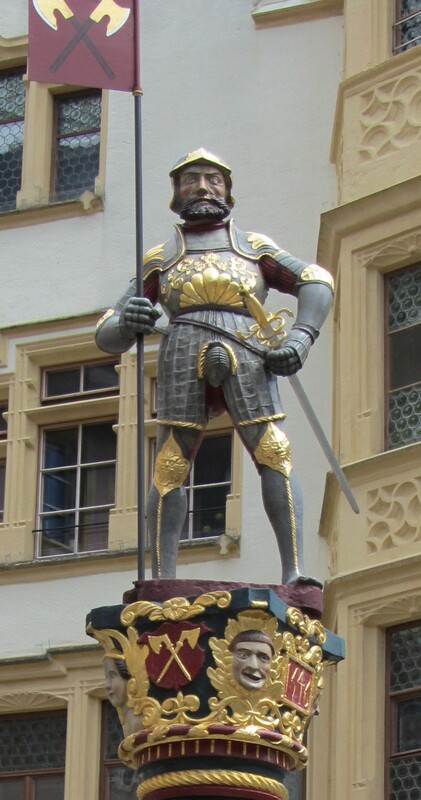 Venner Well: A Swiss warrior statue in Biel’s old town that embarrassed its makers by breaking off at both legs when being set up and then suffering follow-up breakages during stormy weather. 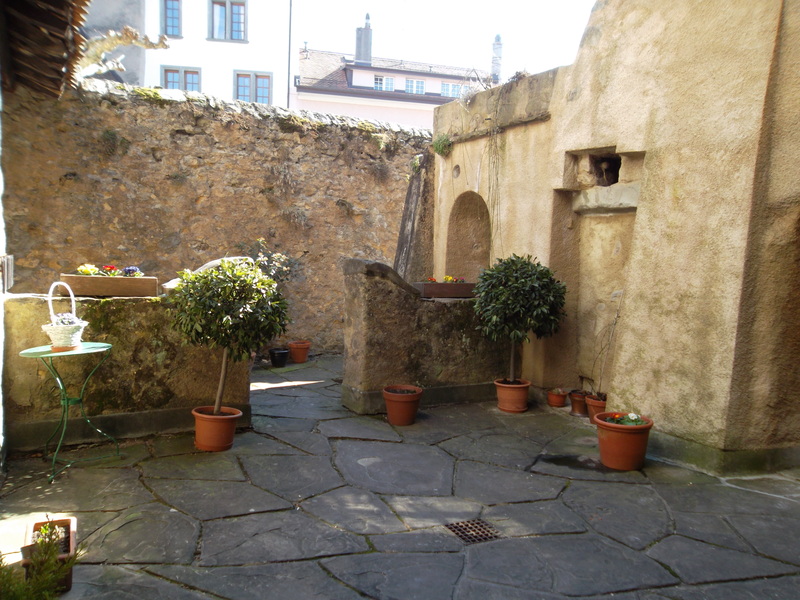 The well dates back to the 1400s; the stone statue may date back to the mid-1500s, but the translated records were not clear on that point. It could be older. Tomorrow we will meet with a young Indian couple and their two daughters who have become like our “Swiss grandchildren.” I preferred to think of them along the lines of nieces, but the parents keep referring to us in grandparent terms, forcing us to accept the fact that we are definitely well into our 50s. Yuk on that. We’re going to miss them, but again we hope they will stop in for a visit some time, although that is less likely as they appear Singapore-bound after their term here. I have not said farewell to my Winnipeg friend and dame of roller derby fame named Jam Buster, because if our paths can cross at a random writers meeting at an all-by-chance Starbucks 7,000 km away from home, you gotta know no planning is required for us to run into each other again. *There is no room service in our house. Never has been. Ask our kids. They may still be bitter about this. Winnipeg at its finest. Photo Allan Lorde, from a defunct website. Winnipeg. We hear its name many times on our travels, because wherever we go, Winnipeg will appear, in one form or another. We cannot explain this. Yesterday, on the ride up a small funicular rail car in our inconsequential Swiss town, a tall Dane seated next to me asked where we were from? Canada, we said. It’s the best answer. We’re both born and raised Winnipeggers, but we’ve moved around a bit and “home” for most of our married life has been on Vancouver Island off Canada’s rock-rimmed, rained-drenched West Coast. “Have you been to Canada?” we asked him. “I’ve been to Winnipeg,” he replied. We expected to hear Toronto, Montreal, Vancouver, but we are starting to realize we should expect Winnipeg. The man talked about Winnipeg’s beautiful women who are fabulous cooks, while he looked down at me, a somewhat shopworn never-gorgeous woman with a questionable culinary record. I suppose he was doubting my origins. As a reporter, I could practically peg a Winnipegger within seconds of meeting, no matter where we were or what the interview subject would be. They always said they could spot me, too. When a young woman with a wide grin approached our writers table in a Bern Starbucks, I figured her for a Winnipegger by her fun eye-rolling ‘we’re all in this together,’ ‘hiyah ol’ buddy ol’ pal,’ demeanor. She also carried that forehead-wrung visage of someone who has navigated ‘crazy corner.’ If you know what this means, you just might be from Winnipeg. Run into a Dane who enlisted with the German army and was stationed in Winnipeg, while we were riding with 20 people in a small rail car up the Jura Mountains in a tiny Swiss town of 70,000? Of course we would. This is how Winnipeggers look at life – as a giant joke God is playing on them that is so rich even they laugh at it because after all, if anyone can write a good punchline, it has to be God. Winnipeggers want to let you in on the joke, too. They’ve made it through winters that make Siberia look like a beach resort. Their summers are spent dodging blood-sucking insects. Every spring, Fargo sends them a giant swell of floodwaters. Winnipeg’s city engineers love this and look on it as a grand-scale paintball game they play with the Americans. 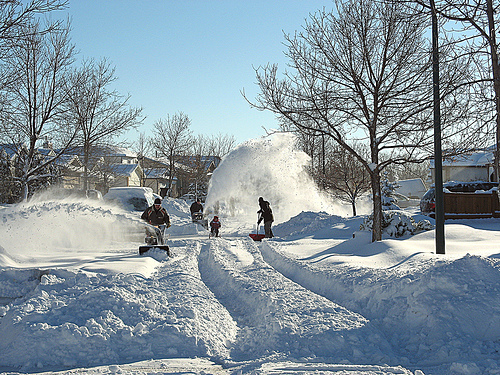 What this adds up to is that any time Winnipeggers are away from Winnipeg, they bubble over with joy. That jubilance makes it easy to pick them out of a crowd. And yet when they are away from Winnipeg, they cannot wait to get back. It might have something to do with Stella’s Cafe and Baked Expectations. Our hotel manager almost moved to Winnipeg; countless strangers we’ve met on rail platforms are from Winnipeg; Dave’s met two people at work who are from Winnipeg; in an Atlanta fitness centre a woman on the treadmill next to me was just back from a winter vacation in Winnipeg. She loved it. The list goes on and on. Winnipeg. Wherever you go, it is right there with you. 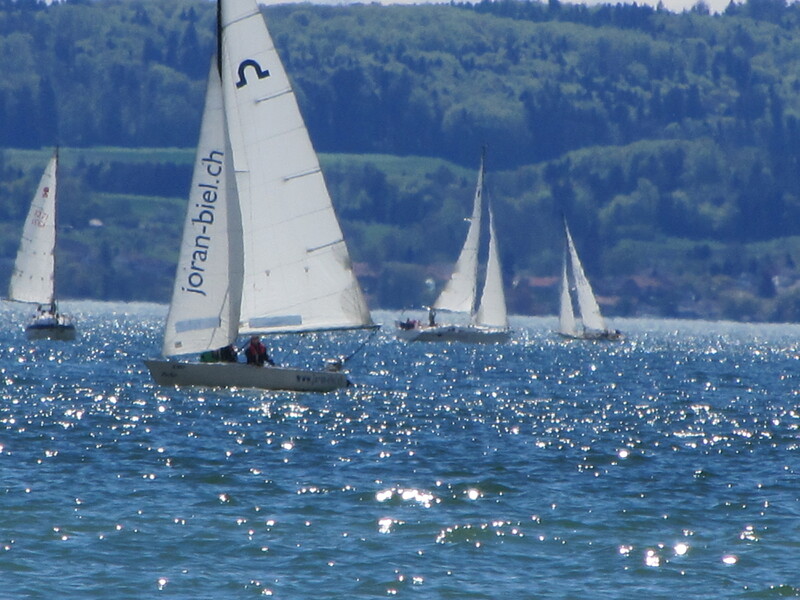 BIEL Alstadt: The sun is out in Switzerland again after a very cool and wet spring. 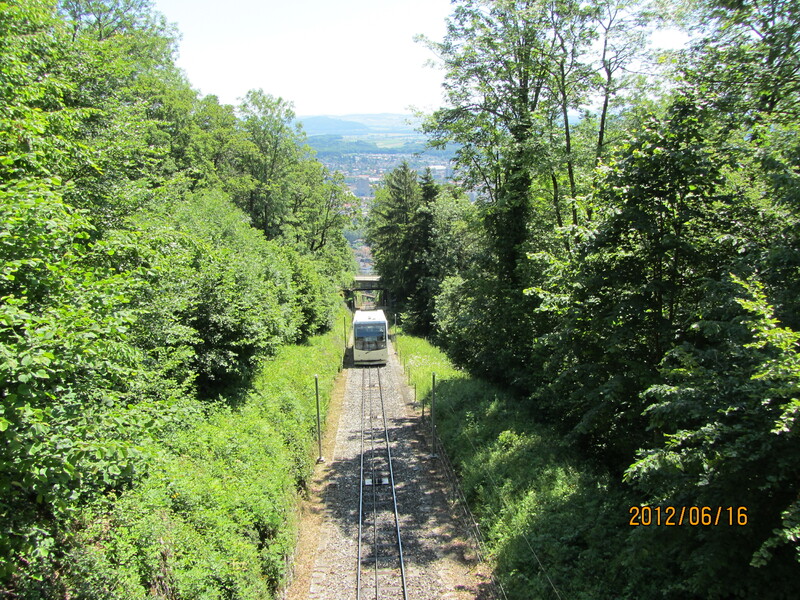 The sun is out in Switzerland again, so we rode the funicular up the Jura Mountain slopes and hiked down. The Juras are mere bumps in the landscape compared to the Alps, but it is still exciting to get lost in them, which we did a few times owing to the pecularities of Swiss signage. Apparently, all roads lead to Biel, but the question on our minds was: Which one will get us there sooner and with less chances of ankle-breaks? If you go: The funicular (rail-car that rides up the slopes) runs every 20 minutes. It has two compartments for bikes (appears able to hoist about 10-15 per ride). Priced at 5.40 CHF (Swiss Francs) per person. Half-price SwissRail cards for residents apply (2.70). 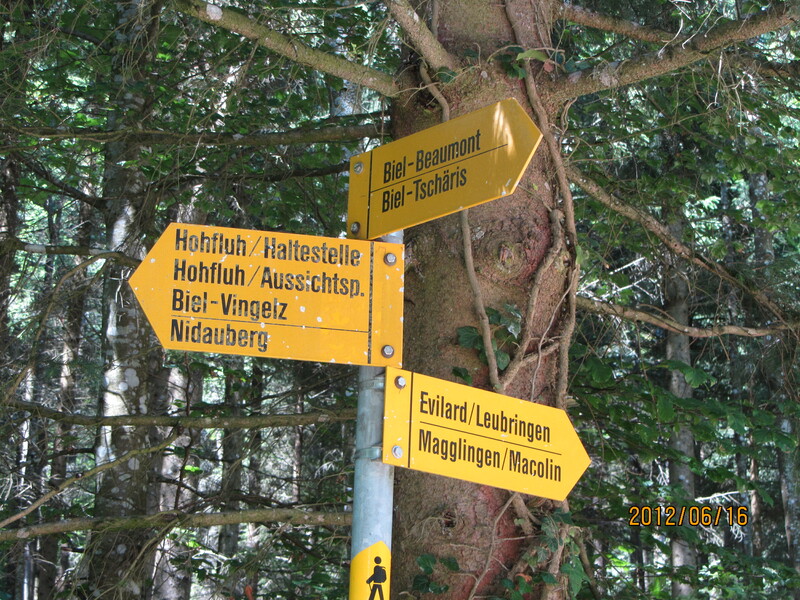 Go from Biel to Magglingen to access the mountain bike trails. For more info, click here. The trail is very steep for the first 50 m, and has a few hairpin turns that create ideal blind spots for careening cyclists to flatten hikers. 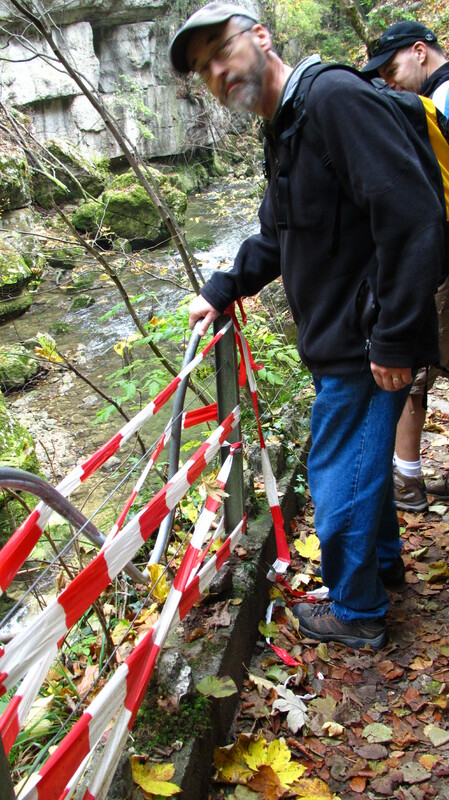 Fortunately, the trail levels and straightens a little after that, making it safe-sharing for hikers and bikers. It took us about 90 minutes to walk from Magglingen back down to Biel. Keep your ears open for cyclists, even on the scarier parts of the trail. We were heading down a narrow concrete stepped embankment when we heard the thwack sound of bike tires bumping down the pavement behind us – yes, a mountain biker in the most unlikely of places. How like the Swiss. They are a sturdy bunch. Okay, most roads lead to Biel/Bienne. For mountain biking types who want to know here the trail-head is: Exit the funicular and go left. 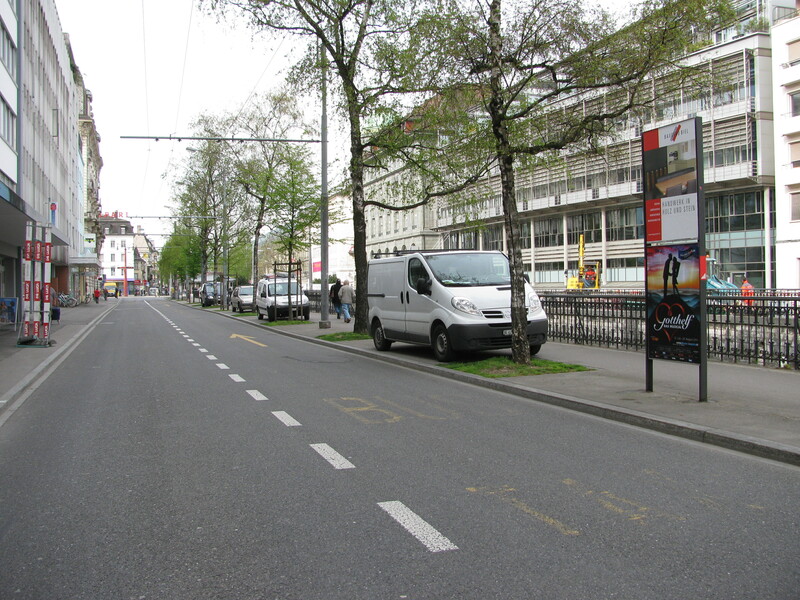 Adjacent to the funicular station (on your left again) is a driveway that drops down to a parking lot. Go down the driveway (about 15-20 metres, maybe less) and you will see yellow signs (again, on your left) marking the trail before the parking lot. 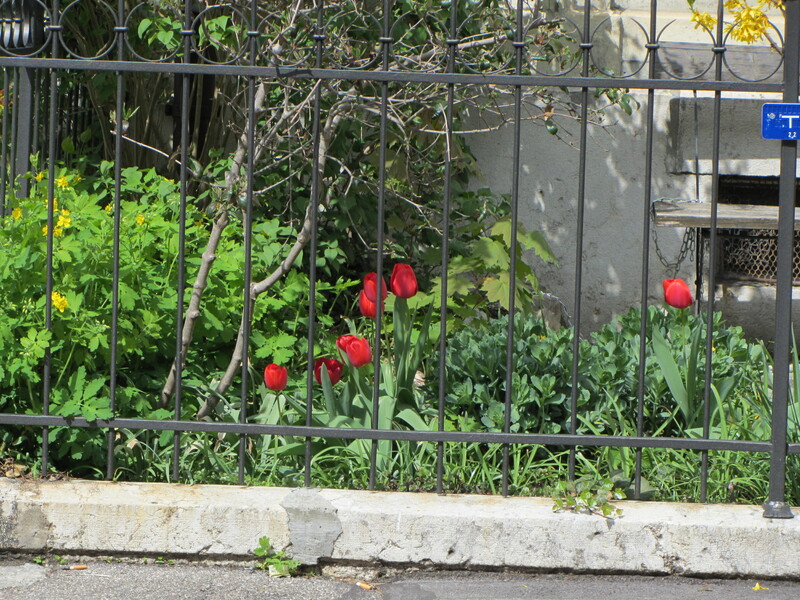 If you go past a gated road you have gone too far. Turn back to the funicular station. Take extreme care. The first portion of the trail is very steep with a deep hairpin turn, although we did see a cyclist whip down it without injury, so maybe I overestimate the trail’s treachery. The rest of the trail does not look so frightening. Most hits on HoboNotes from: Canada, U.S. and Switzerland. 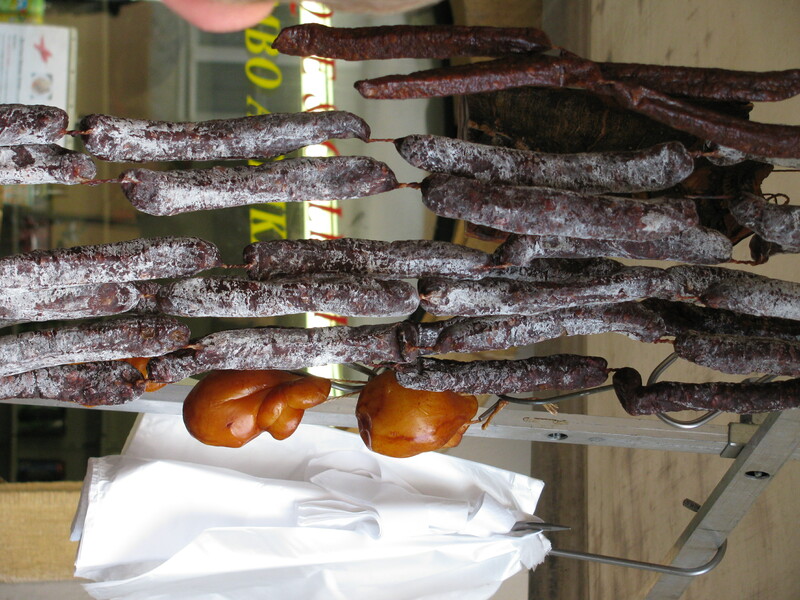 Top Post for the Last 30 Days: Paris food – can you eat lamb’s kidney without having to sell your own? Fun search term that brought a reader to this site: My tooth is breaking into pieces, which is exactly what happened the first week we arrived here in 2011. Second most fun search term: Loons that attack people This suggests that I am not the only one to fall victim to this musical but menacing (on at least two occasions) carnivorous waterfowl. This part of the trail was not so bad, but it is still steeper than it looks. We saw a salamander and a deer while on our walk. I went to whip out my camera to photo the deer, then remembered we see deer almost everyday back at home in Canada. Later, I had regrets. It was the first Swiss deer we’ve seen. The view looking back from our table at a Joral’s waterfront restaurant. That white dot you see near the top of the mountain is the start-spot for our hike. The fruit in our Swiss town’s shops has taken a decided downturn. Earlier this week, the strawberries were flecked with fruit flies and the raspberry display did not have the same oomph it showed earlier in the season. Blame spring. 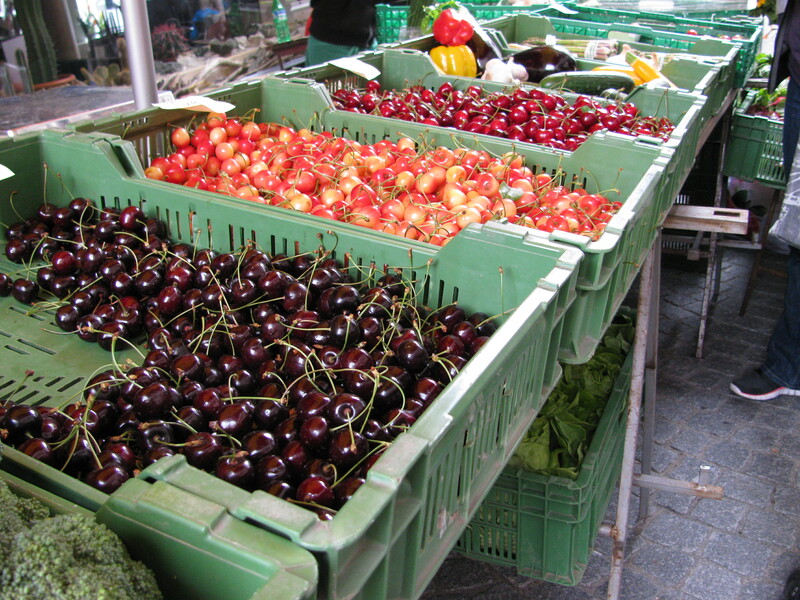 On our town’s main market street is a 60-something woman with a van, a table and two flats of cherries selling for 11 Francs a kilo. She doesn’t even have any glaring signs to attract buyers; only two small handwritten cards posting the price and that the cherries are from our town. Granted, her penmanship is exquisite, but I don’t think that is what’s tilted the produce market in her favor. 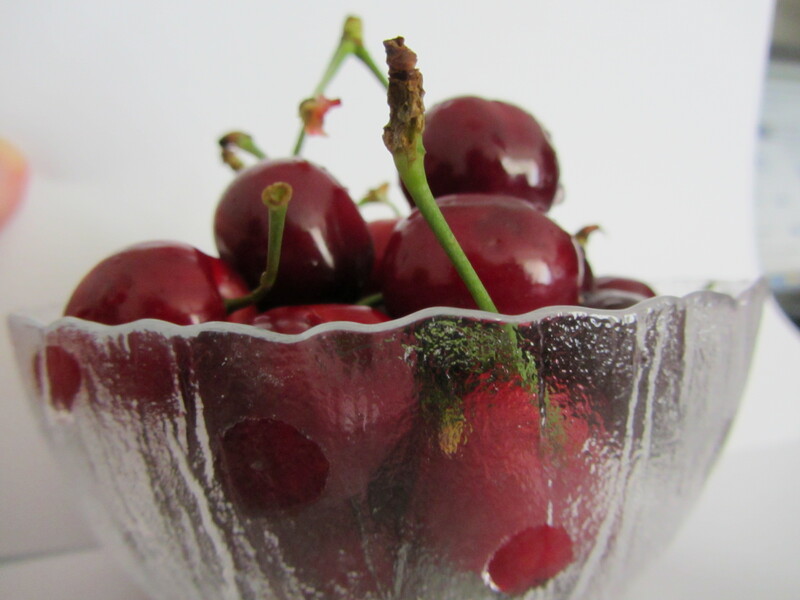 It’s the cherries – plump enough to rival those grown in Washington State, and so flavorful that one can almost taste the leafy trees off which they grow. I’ve lived in some great produce regions in my life. Who would have thought Switzerland would turn out to be one of them? Biel’s “beachtown” is up and open for visitors. Admission is free, and visitors can lounge all day if they like, but only vendor-served food and beverages are allowed inside. Not being able to read the German/French/Italian signage, I popped open a can of Coca Cola at last year’s beachtown and was quickly informed about the ‘no-outside food’ rule. In classical Swiss fashion, however, the staff told me this discreetly, quietly, politely and said it was fine for me to finish my Coke, but please remember to buy from a vendor next time. I’m okay with this. After all, vendors’ fees contribute to the creation of this oasis. Bouncers in black uniforms stand at the gates, possibly to keep out Biel’s increasingly cantankerous street crowd of alcoholics and druggies. Alcohol is served in Beachtown where we’ve never seen anyone misbehave, but then we’re usually back in our hotel room before ‘party hours’ really begin. Nonetheless, this is Switzerland, the land of good manners and we expect that for the most part, the Swiss keep it reined in. There’s all kinds of food available inside, including some delicious smelling Thai fare that we plan to sample soon. 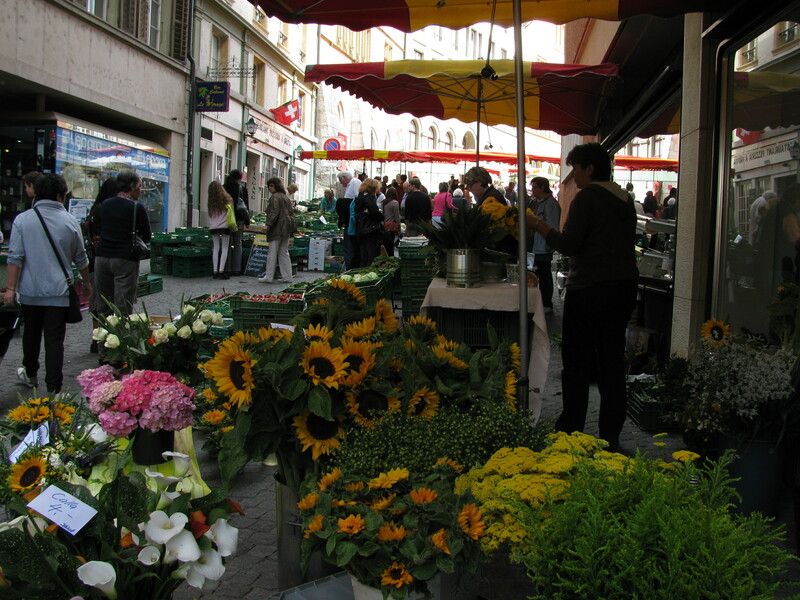 Biel's thriving Saturday farmers market is a good place to shop. 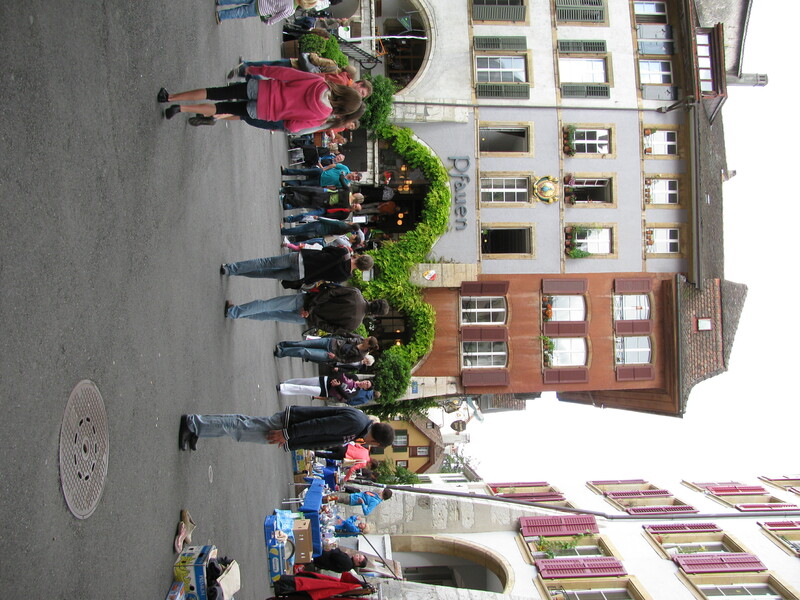 It is Saturday on the Easter four-day weekend, which in Switzerland means it is time to jam the shops to load up on food. 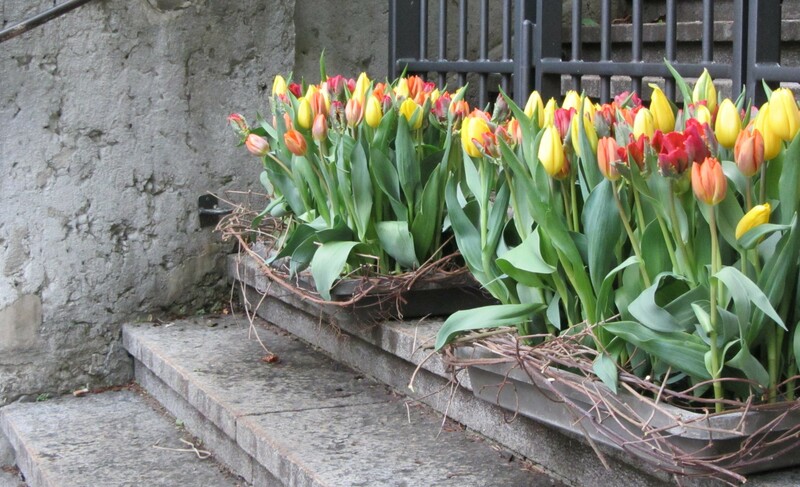 Tulips on the steps of the Biel old-town Church (we think it is Catholic-turned-Dutch-Reformed). 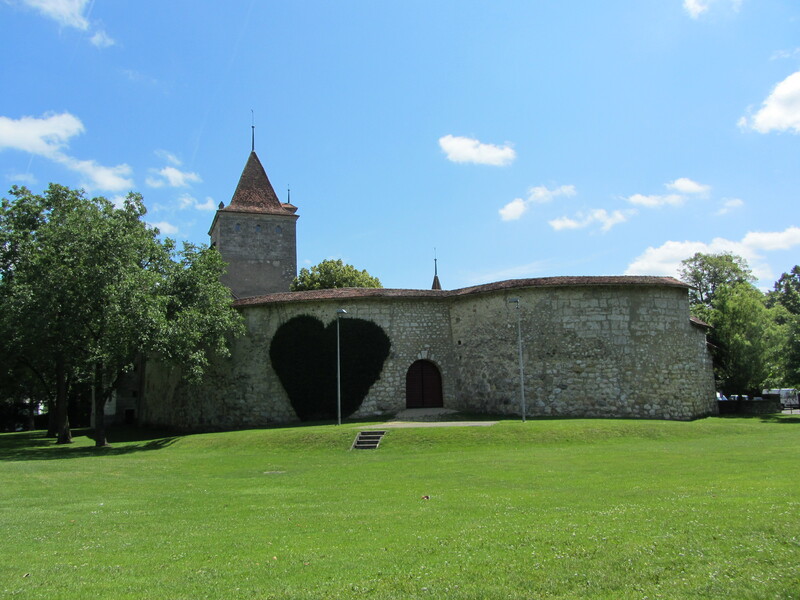 This congregation was listed in Lausanne's register in 1228. 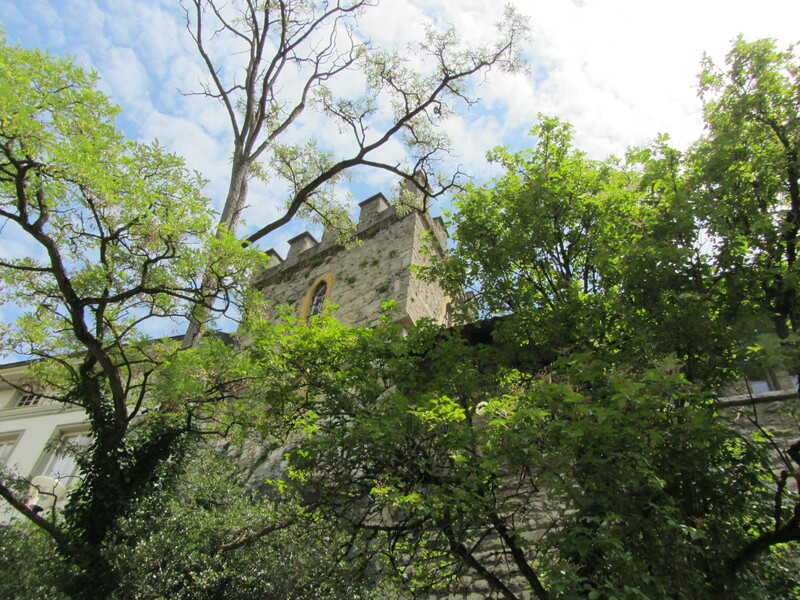 The current church building dates back to the late 1300s. Not that we can load up on much, what with our miniscule camping-cooler-sized fridge, but we will do what we can, because the shops were all closed yesterday and will be closed for the next two days. Today is the retail oasis in the sandy desert of commerce in our little town. People also leave garbage on the church steps. It must be a pick-up zone. 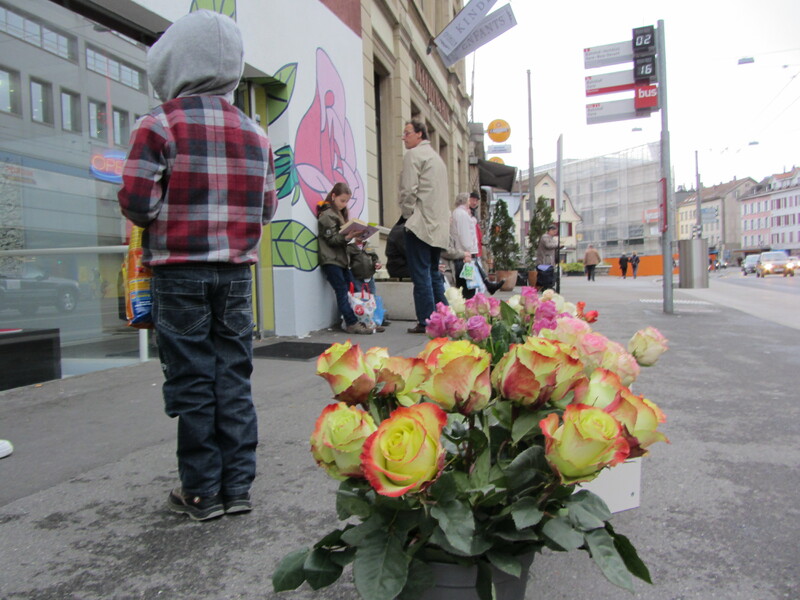 It takes some effort to adapt to Switzerland’s restrictive shopping hours. Back home, the horror of two non-shopping days would be soothed by a full-freezer, amply stocked kitchen shelves and a refrigerator happily humming as it cools buckets of produce, deli meats and other foodstuffs. There in North America, on any given day, 20 people could drop in unannounced and we would be ready to put on a spread that based on the usual contents of our larder could include: Barbecue meatballs, meatloaf, mesquite chicken, spaghetti, pizza, lasagna, quiche, chili dogs, Kraft Dinner, homemade soup, hot rolls, and ice cream. 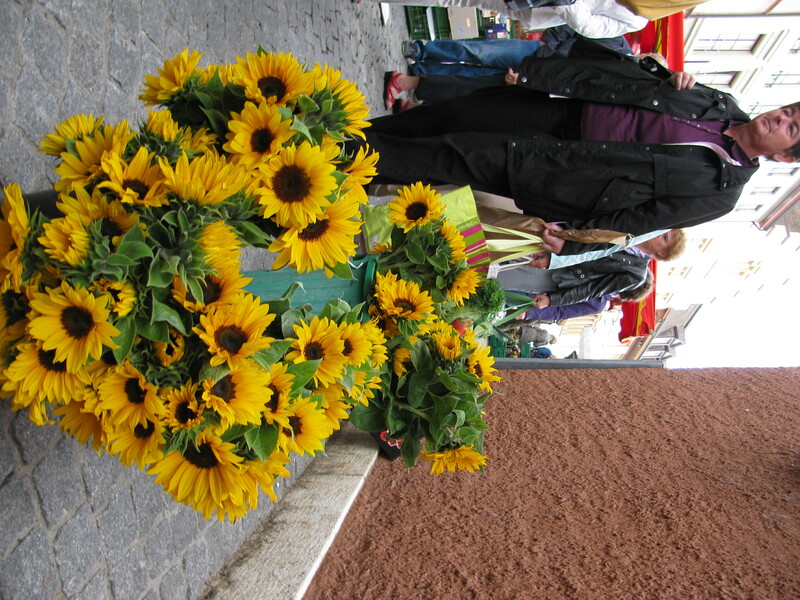 The Swiss carry their flower bouquets upside down. Also, Swiss men carry pink plaid shopping bags and seem wholly unaware that in a North American school ground, this would get them beat up. Here in Europe, they would get three Ritz crackers and a thin slice of Brie. Once, when our Canadian mountainside home was cut off from civilization by a sudden and deep snowfall, locking us in with our adult son and his three friends – young men with corresponding elephantine appetites, we were able to keep everyone fed for three days and still have slabs of frozen pizza in the freezer should the snowfall extend their stay even longer. Were that to happen here with our tiny food stores, the result might a lesson in how swiftly companions can turn to cannibalism. The horror. 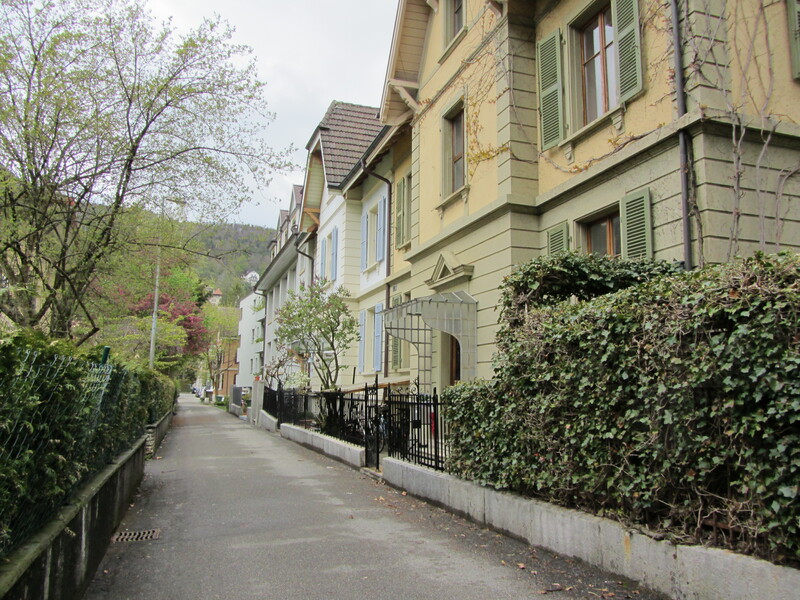 On one of Biel's main thoroughfares, edging onto the medieval town district. Biel's medieval village is relatively small but we still got lost in it while trying to find a particular clothing/coffee shop. 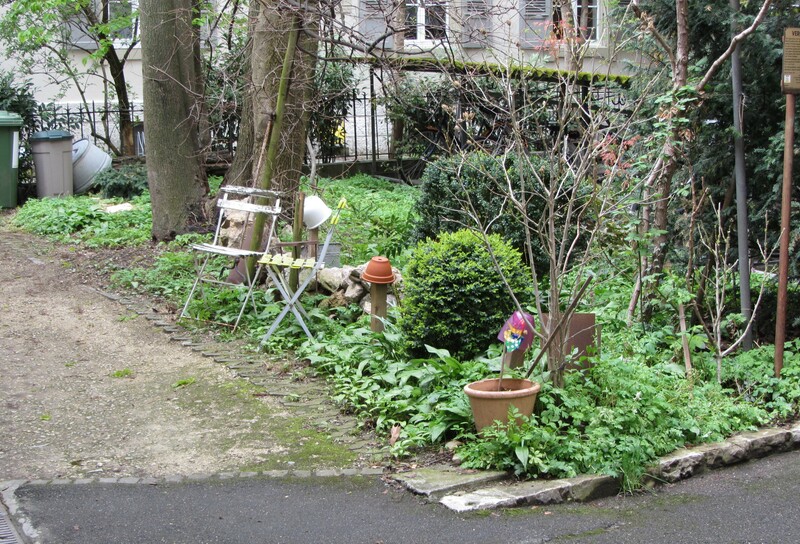 Getting lost is good: It brings us to charming little vignettes like this tumble-down hidden courtyard. Christmas Eve, we walked up narrow cobblestone alleys to a church dating to the early Middle Ages, our minds anchored to the remembrance of all the generations that made this same trip on this same night through centuries past. 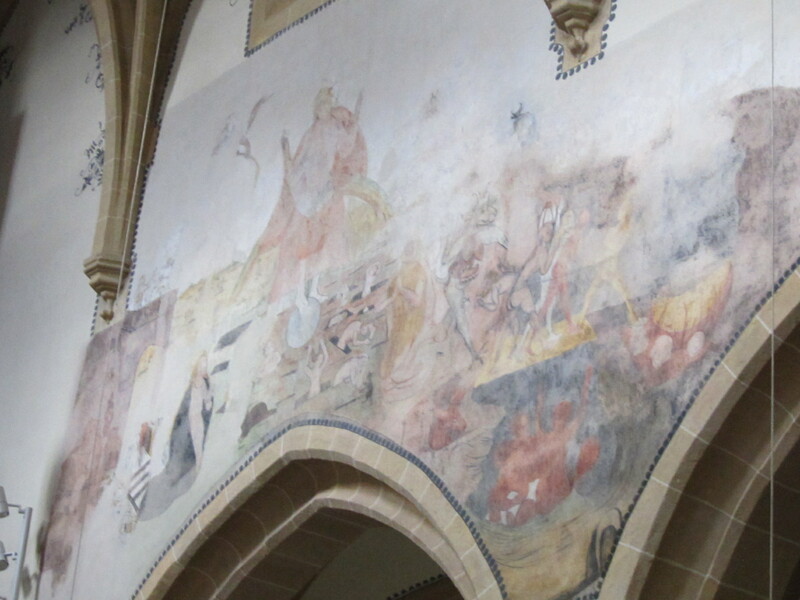 The church is set in the uneven footings of the Jura Mountains, an impressive Gothic building with high ornamented vaults, a massive pipe organ, polished stone floors and faded murals high on its clerestory walls. It tests the nerves to sit through a service in a language we have yet to grasp, with customs to which we are clueless. Would the congregation do cartwheels? Sing a Las Vegas show-tune? Expect us to stand up and explain ourselves? Test our mettle by demanding we sing Handel’s Hallejulah chorus? Make a public confession of some sort? 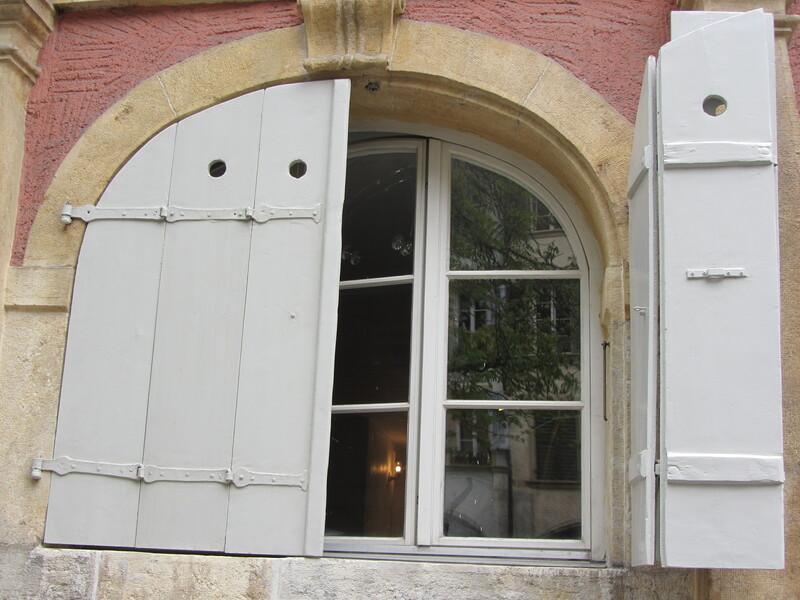 The people were quiet – in a building fashioned from stone and stained glass, one expects to hear echo, but it was hard to pick up even a scratch. The service started precisely at 11 p.m. – we are, after all, in Switzerland, the land that guards time. The only decoration was an evergreen tree, adorned only with electric candles, a small wreathe on a flat-cut stone altar and a single burning candle. A white-haired man in a black suit stepped slowly from the front of the church, not in an air of pomp or down the centre aisle, but in a subdued manner, off to the side, unfurling a beckoning solo from a woodwind instrument. The pipe organ chimed in and this went on until a small man in a black clerical robe with a white bow took the podium. He started reading, and although it was in German we recognized it as the Gospel narrative. He read of Mary’s visitation from the angel, Bethlehem with its paucity of hotels, Jesus’s birth in the grit of a Middle-Eastern stall. The reader paused now and again, at which the pipe organ filled the church with sounds very much like a steady wind moving through a forest. And so the service went, woven between a single human voice, answered by the pipe organ’s choral timbres. In the silent moments, there was not a sound to be heard, making us wonder about the difference between North American and Swiss Christians. North American churches are alive with noise, shuffle, chatter, even the more stoic ones. This is the first time I’ve sat in a church where there was literally not a sound, a cough, a swish of fabric or the scrape of shoe against the floor. It was as silent as though we were not there. We sang four songs from the hymn book, beginning with A Mighty Fortress is Our God. As midnight approached, the minister came into the congregation with a candle with which he lit the candles that we had been given at the door. There was no music or reading, just the sound of people tilting their candles one to the other, so that the drops of light slowly spread back into the dark. 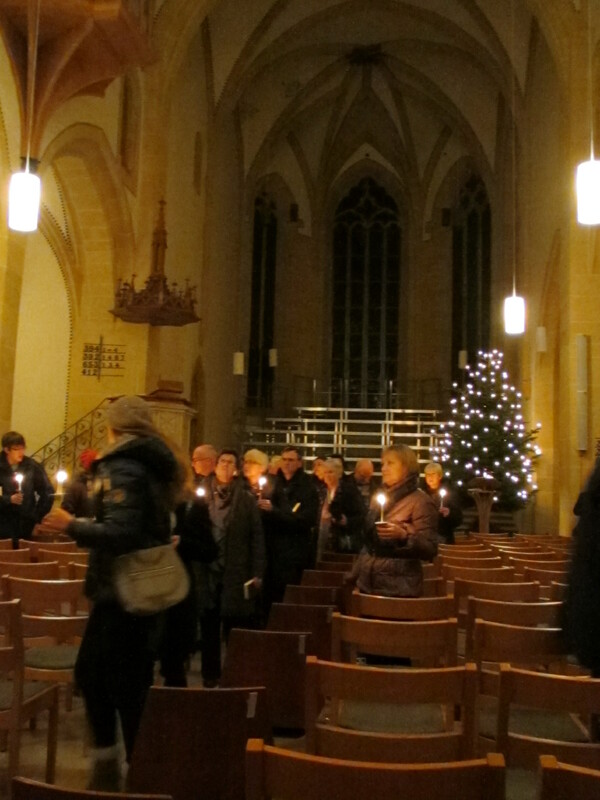 When all were lit, the churches lights were turned off altogether and we sang Silent Night. The pipe organ sang one more piece and then without benediction or comment, the congregation rose and drifted outside, some still carrying their candles into the tranquil night, painting amber pools against the grey cobblestone. 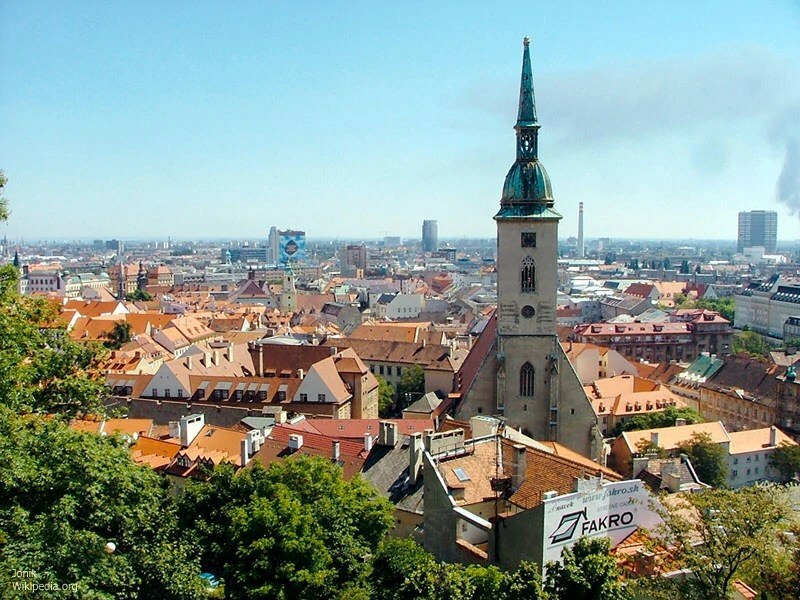 We may be entering an electronic cone-of-silence over the next few days as we travel east by train to check out Viennese pastries and Bratislava’s …. well, whatever it is that makes Bratislava what it is. Auf wiedersehen. 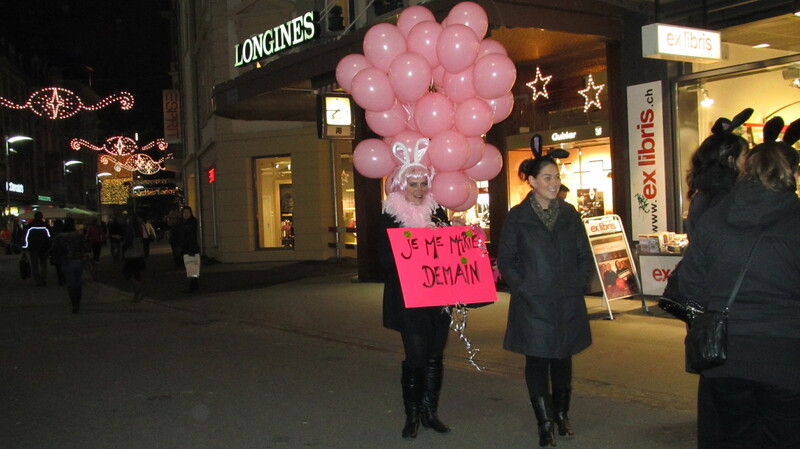 Thursday night, as we strolled Nidaugasse, our town’s pedestrian thoroughfare through its retail district, a young balloon-festooned gal approached us, speaking in French. We weren’t afraid. We’re from Canada. We’ve seen people dressed weirder. We happily explained that we do not speak French, did not understand a word she said, so we could not give money to her cause/protest/campaign or accept any pamphlets which would be indecipherable to we unilingual clodheads. It turned we were wrong on all counts. She is getting married today, and so her girlfriends, dressed in little black bunny ears, were taking her out on the streets where she sold little waxen candies in honour of her impending marriage. I’m not sure what this is really about in terms of whether it is a tradition or just something goofy her buddies thought up, but her happiness was infectious. She offered us a candy for any amount of money and we regrettably had to inform her we carried as much money as the Queen of England, which is to say not a penny. I had not even brought my wallet. She gave us a candy anyway, and we wished her a beautiful wedding day and happiness in her marriage. On the same street earlier in the day, one of our town drunks wandered bellowing belligerently such that he actually cleared an entire block of pedestrians. I did not have my camera to show this, but it was fascinating to the see the one guy in the street, while the blocks on either side of him were filled with shoppers. A picture like that would terrify Victoria’s Ken Kelly, an affable chap who runs the Downtown Victoria Business Association in British Columbia, Canada. They are a group of retailers who can be found hand wringing over the commercial degradation of Victoria’s downtown due to its sad street population. And speaking of town drunks, our leading town drunk was seen up in our neighbourhood this week, walking straight and tall, dressed jauntily like an old sea-captain and looking incredibly sober. We’ve seen him thus several times, and doubt this is a twin, because he has a distinctive mashed up nose that can only be the result of some serious injury or accident, not something likely to be repeated by nature. And that’s the news from our town’s streets. A happy bride and a screeching alcoholic, each affecting the street atmosphere in their own way. 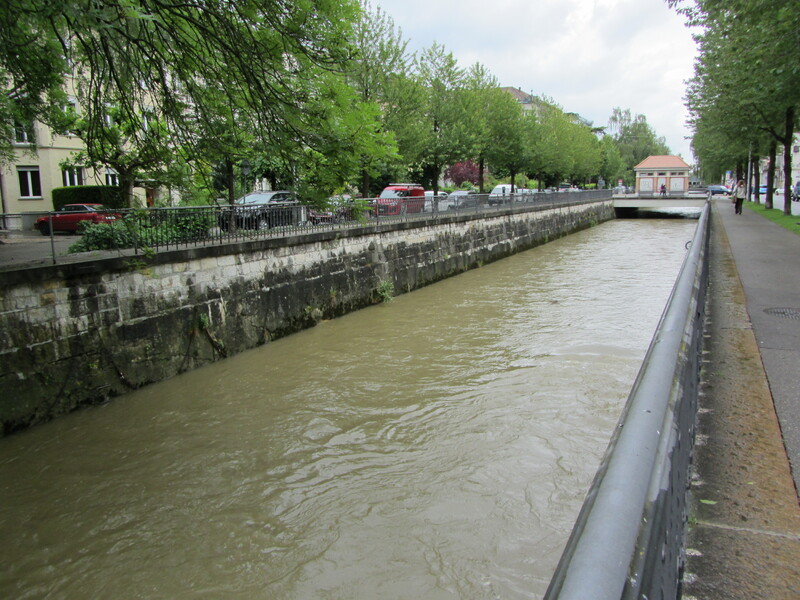 Now this is a proper Swiss "river," running straight and orderly as all Swiss waterways should. Note: An untamed creek/river ran alongside it. 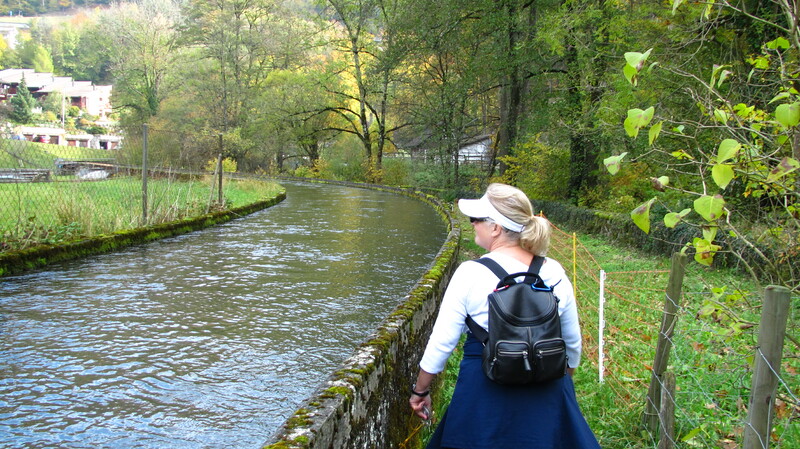 The Swiss are not to be outdone, they will have every kind of waterway. TAUBENLOCH, BIEL/BIENNE, SWITZERLAND I received a note from one of my darling nieces this week (I have 11, no wait, that’s 12 nieces, plus one genius-Goddaughter), asking for my advice on where to travel as she’s planning to trot across Europe next spring. The thing is, there are so many places to go that she could play pin-the-tail on the European map and land just about anywhere interesting, except for Olten, which we have already established is not worth visiting. 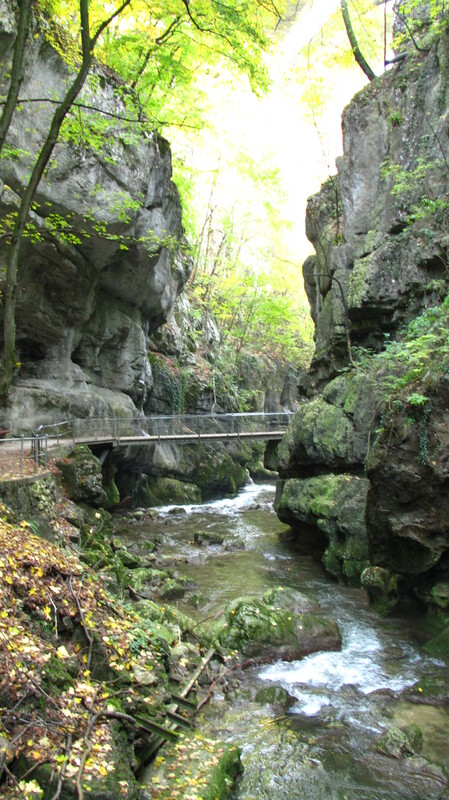 The Taubenloch gorge trail criss-crosses the Suze River as it falls from the Jura Mountains down into Lac Biel/Bienne. 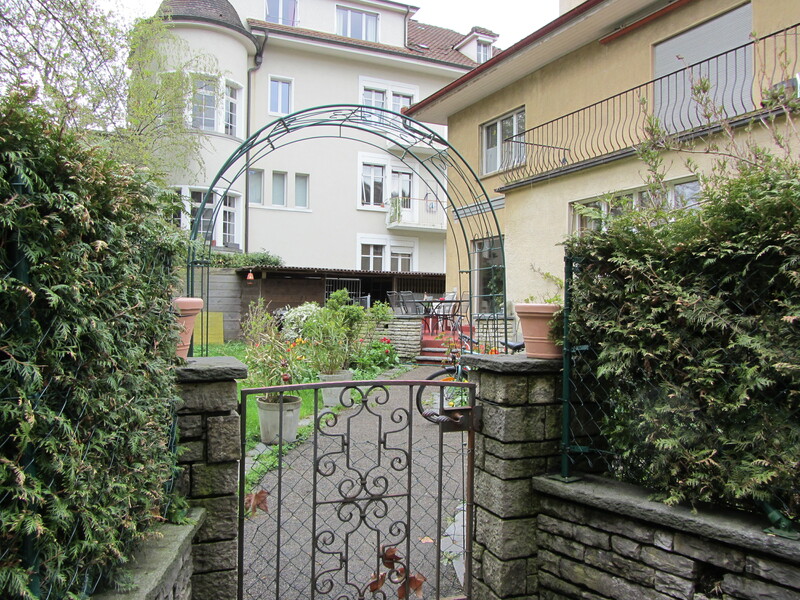 But, Olten aside, we have done some random drop-in touring and been pleasantly surprised, as we saw on our trip to Thun, the not-so-well-known Swiss settlement north of the Bernese Mountains. 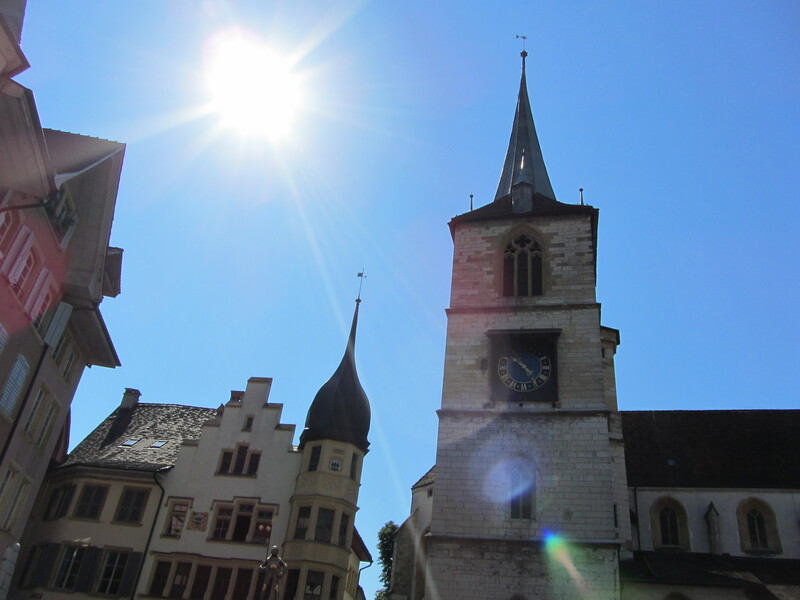 Although it receives as little attention as Olten when it comes to tour guides and online searches, it turned out to be a fabulous place. 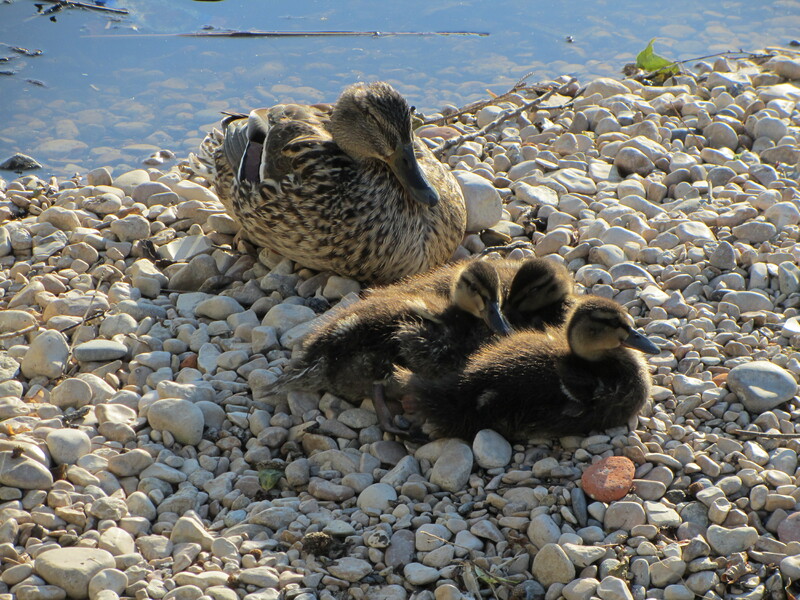 Click here and here to see past posts and pics on Thun. 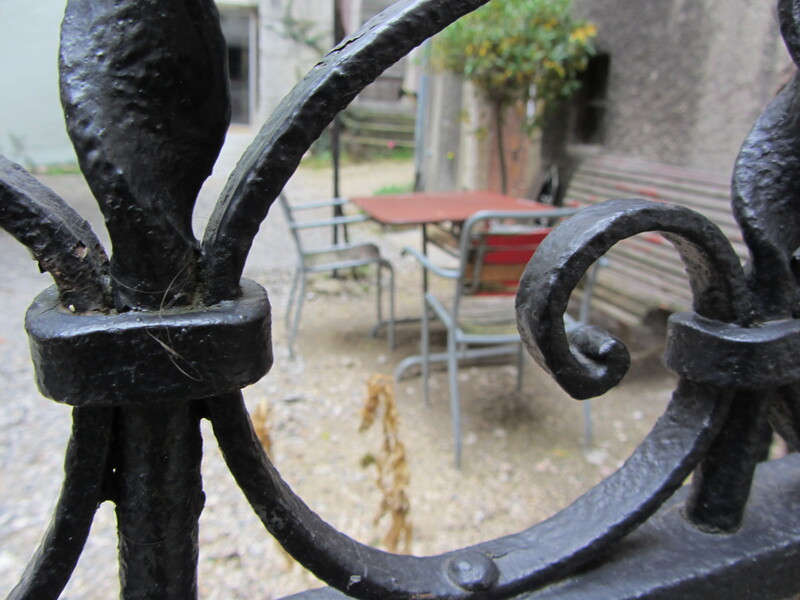 Europe is full of such lovely finds and not just in medieval villages, cathedrals, castles and pastries. 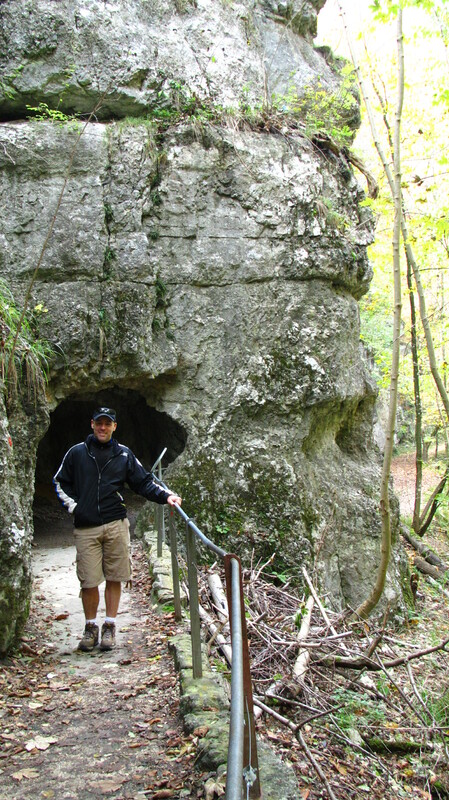 We discovered a treasure in a canyon trail just north of our town of Biel/Bienne. It swoops down into a steep limestone carved gorge that bellies out in a fast-moving river, or maybe creek. It’s not clear to me what qualifies as a river, as I’ve seen “rivers” in Spain that had all the panache of the ditch that ran in front of our small-town-BC home back in the 1990s. Yet the Spaniards called this worm of a waterway a “river.” Fascinating people, the Spanish. You can understand that when someone describes something as “fantastic” to me, I reserve judgment until laying my own eyes on the thing. This is what happens to people who have lived in Spain. They are forever sceptical about everything. Check out the metal railing, bowed by falling rock. 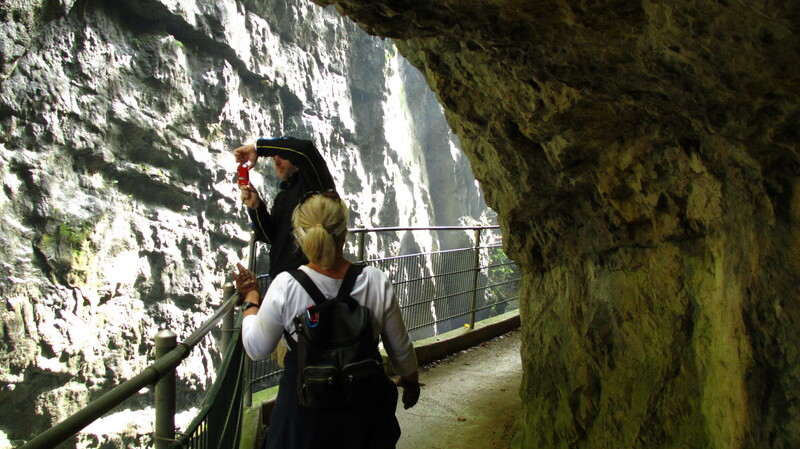 The Swiss know how to add excitement to a cliff-side trail. 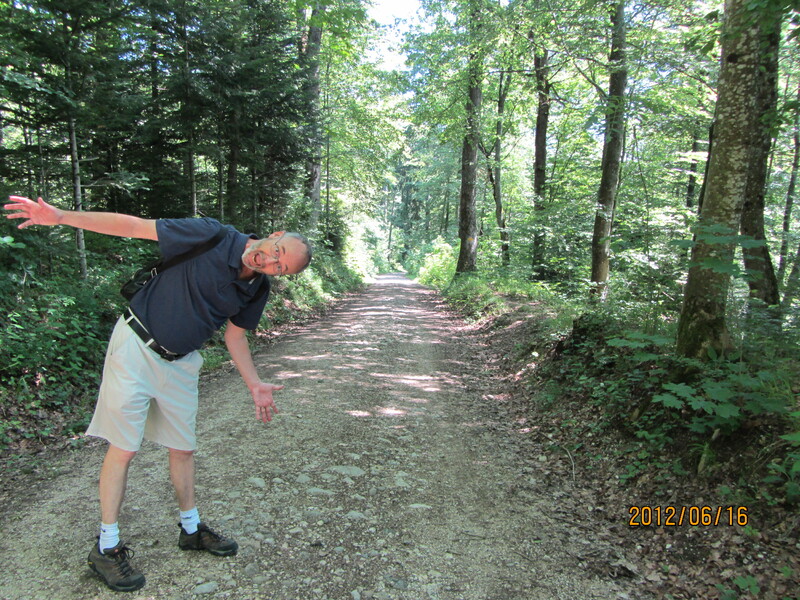 But the Taubenloch trail is nothing to be sceptical about – it turns out that it is a charming, although sometimes alarming stroll. The alarming part is the ample evidence of landslides as can be seen by security tape and warning signs around badly deformed metal railings where the falling boulders have messed with the trail. As late as 2009, the trail was cut off due to a number of landslides. This makes walking it a very exciting venture, indeed. A southerly portion of the trail scoops out of the limestone walls of the gorge, such that walkers are directly underneath massive overhangs of rock, overhangs that have visible stress fractures in them. It quickens the pulse as well as the pace. There are gorges and waterfalls more grand to be found south of us in the Swiss Alps, but I am a scaredy-cat, so this was just the right start for me. I’ll try the big stuff later. The prospect of this stone ceiling caving in on us did not bother Dave's coworker, Mike. gentle downhill in a southerly direction, crossing the Suze River several times via walking bridges. At a slow pace, you can cover the trail in 45 to 60 minutes. It is reported to be only two-kilometres long, although with all the winding and such, my pedometer showed it to be much longer. Cost: We didn’t pay a cent, although as we exited the trail on its south end, we went through a gate, along with some signs in German or French, so it is possible there’s a donation box. The trail is said to be maintained by a non-profit society. 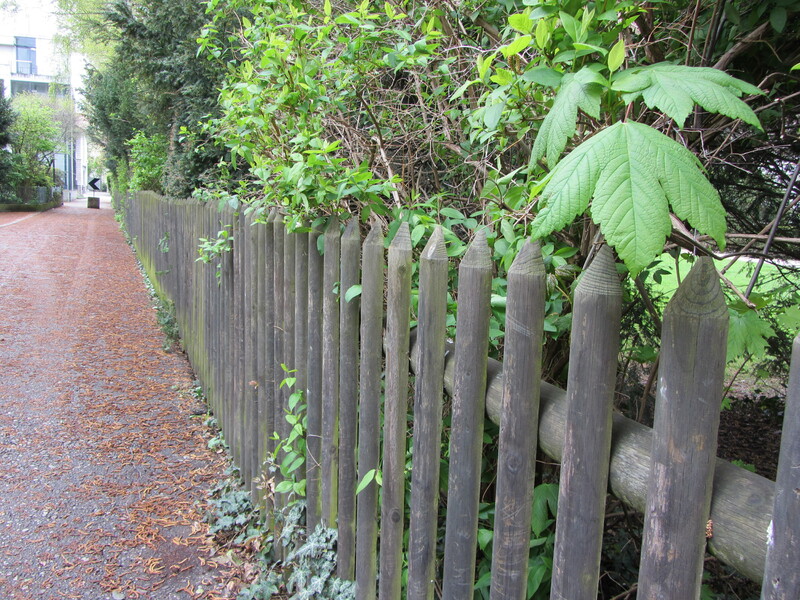 One other thing: The southern end of the trail comes out right into a Biel/Bienne suburb, and you can walk all the way back to the train station or look for a bus. I can’t give any advice on the bus, because we walked back home, which took less than an hour, although we did have a leisurely browse through an outlet store along the way. No nature hike is complete without at least one stop in a shop. Xenophobe’s note: I mock the Spanish for their idea of what constitutes a river, but in all fairness, the Swiss would probably mock me or my fellow Canucks for finding Taubenloch to be awe-inspiring. This is because the Swiss own Switzerland, a pretty fabulous place in every way. 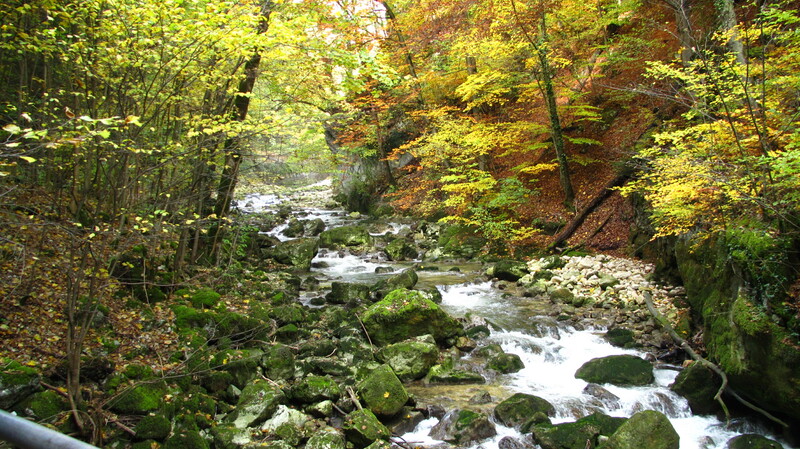 Autumn is a lovely time to walk Taubenloch. Rob van Wely and his travelling audience. 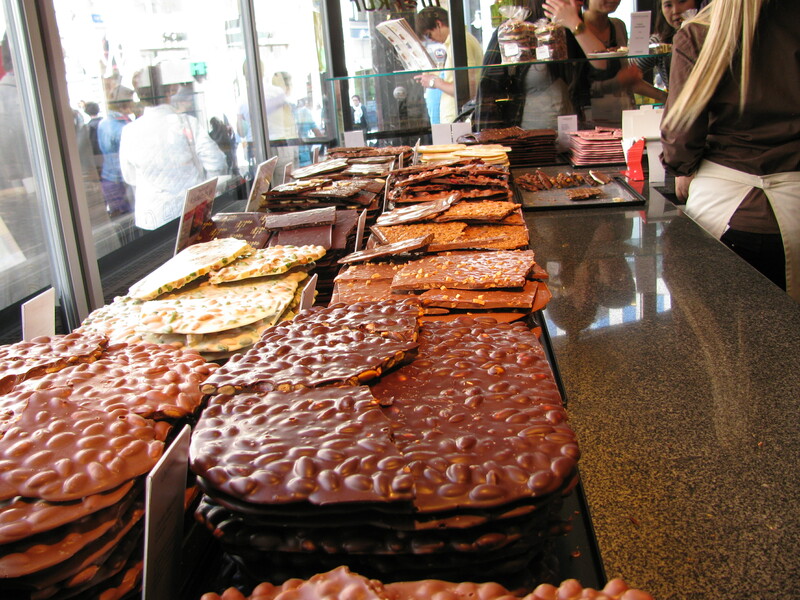 Biel is a small place in the grand scheme of all things Swiss. It’s not Lausanne, Bern, Zürich, Lucerne, Geneva – all of which have the air of international cities. It certainly lacks the grandeur of Zermatt or the Alps, which are further south, but it is charming nonetheless, and has so many festivals that any North American city of a similar size appears comatose. It also attracts a fair number of street performers. It is hard to qualify the value of these musicians. We’ve seen some in Victoria that were raspish to the point where listening to fingernails screeching along a chalkboard seem like a pleasant alternative. In Switzerland, thus far, the street music has been very good. Maybe the old stone buildings add a particular acoustic value, but every weekend we are amazed at the performances so much that we-the-cheap regularly drop money in their upturned caps. 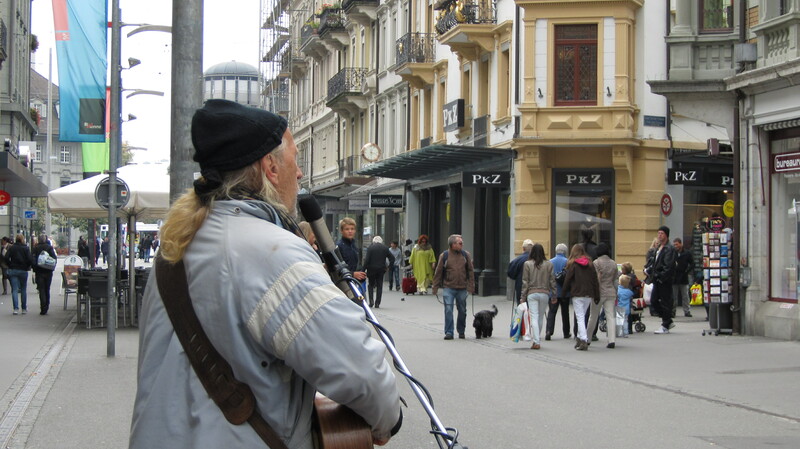 Here in Biel, we ran into a James-Taylor-ish street performer, Rob van Wely, a modern-day troubadour with a silky voice. In his limited English he told us he’s from Holland, and didn’t seem believe his voice was so nice. Decide for yourself. Check out his performance in Biel by clicking here. “I whistle better,” he said. He was told 25 years ago that his voice is bad, and he admitted that to be heard over a crowd, he tended to yell. It stole away the gentle nuances of his voice meandering up and down the scale, and so he worked on his guitar-playing and whistling, but then discovered the magic of amplification and brought his vocals back to his performance. Tomorrow, I’ll post another video of a street performer in Thun that could change my mind about the quality of street music. I just haven’t decided yet. Look here at AngloINFO, a Geneva-based website with some handy data for foreigners living in Switzerland. Look to your right to see a new weather box on HoboNotes. It’s a graphic that depicts the local weather reports (as they come from Bern, we’re too small here in Biel for our own weather reports). It is very cool, thank you to my friend C.A. for pointing it out to me. 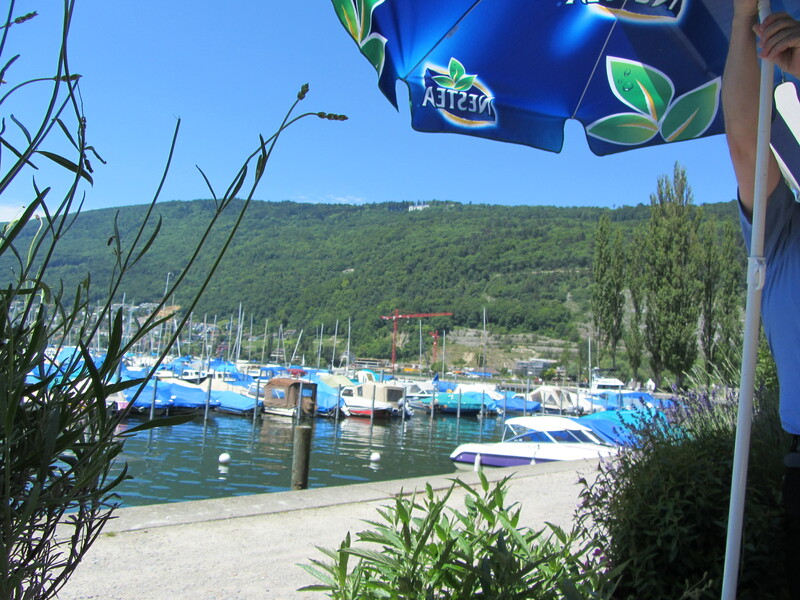 For those who prefer the real thing, go to the Blogroll box to the right and click on “See it now” to go to a webcam showing you a view over Lake Biel, updated every 15 minutes. Somewhere along the way, the Swiss noted the growing popularity of marathons. Factoring in that as many as a half-million Americans complete them in a year, and about 500 marathons are held worldwide annually, our local Swiss decided 42 kilometres must be too easy. 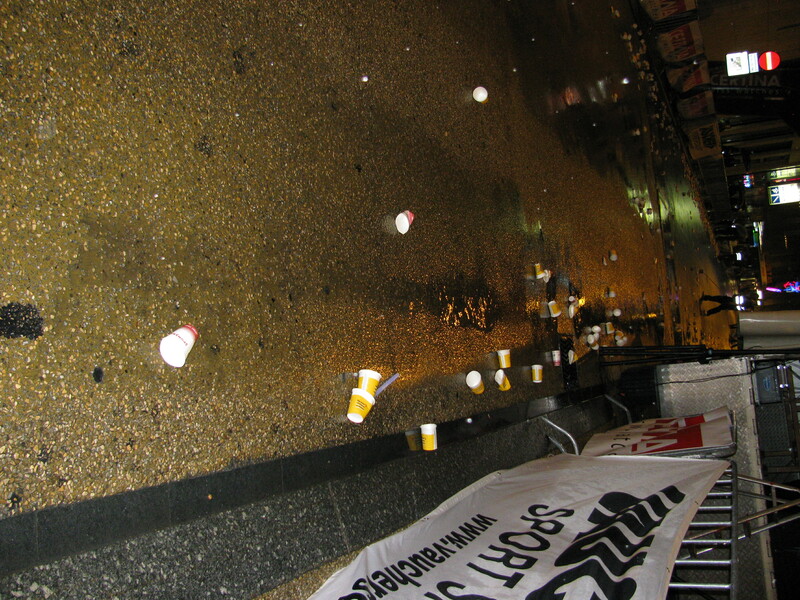 And so the Swiss of Biel/Bienne introduced a 100-kilometre race, and to protect against it growing too popular, and therefore, easy, they run it at night. It is going on right now, as I write this, although it is just after noon here, but that is what happens when you run a ridiculously long race – it becomes an around-the-clock event. 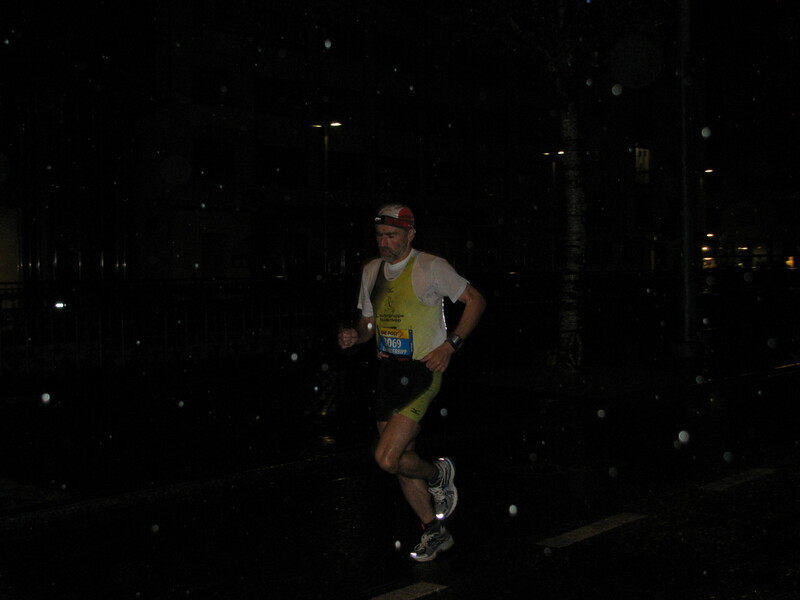 If history is an indicator, somewhere in the neighbourhood of 4,500 runners took off from downtown Biel, running right past our hotel, so at a few minutes before 10, Dave announced it was time to go downstairs to watch the runners. At precisely that moment, my Skype box popped up, showing a friend who has been wrangling with a head injury was online. “You go ahead,” I said. “I’ll just see how the head injury is coming along.” I said this because I believed it would take the runners 10 minutes to get to our corner and that it would be the same as past races I’ve attended or covered as a reporter – in other words there would be at least 10 solid minutes of human flesh pounding the pavement. It turns out I was wrong about that. Before I had gotten a full report on my friend’s condition, Dave returned to the hotel room. The runners had surged past in one giant overflowing bubble, instead of the long train we had expected. This is a good time to point out that Dave has scored a victory in the “Hurry up, Jo, we’re going to miss it” department of our marital history. Good for him. He wins. I have learned my lesson. The runners were supposed to loop around our area twice, so I abandoned my friend and raced down to catch the second surge. It never appeared. Police officers controlled the intersections with gates, the roads were closed to traffic and down the road we could see throngs of spectators. But no runners. We wandered a block down, and saw a few stragglers on the course. We waited. The crowd’s energy flattened, although music still blared over the loudspeakers. Then two front-runners came into view, whipped around the corner decisively and were gone. Ah, the pack must be coming soon, we said. After more than 10 minutes a single runner came down the street that was flanked with overarching balloons and marathon paraphernalia, which suddenly looked like a lot of fuss over not much. I readied the camera for him to turn the corner, but then instead of turning he went straight. No one stopped him. Not speaking the local languages and unable to discern whether the idiots were us or the race-marshalls, we shrugged and waited. Minutes passed, the spectators started to break up, and then another lone runner appeared. This one turned the corner where the front-runners had and we surmised that the earlier lone runner had made a dreadful mistake, or perhaps he was on one of the shorter races that runs concurrent to the 100-km race. Then this last runner turned back, ran up to one of the reflective-jacket-wearing race marshalls who directed him back up the road. A runner going in the opposite direction of other runners at the Biel/Bienne 100k on June 17. Either he is the only guy to memorize the course and so he's ignoring the race marshalls, or he is but the first of many on a misdirected course. It turns out we were right about that. This morning I checked the race website to see an announcement that gosh-darn-it the organizers are blushing, but it seems that the entire field of runners was misdirected, thus cutting seven kilometres off the race. 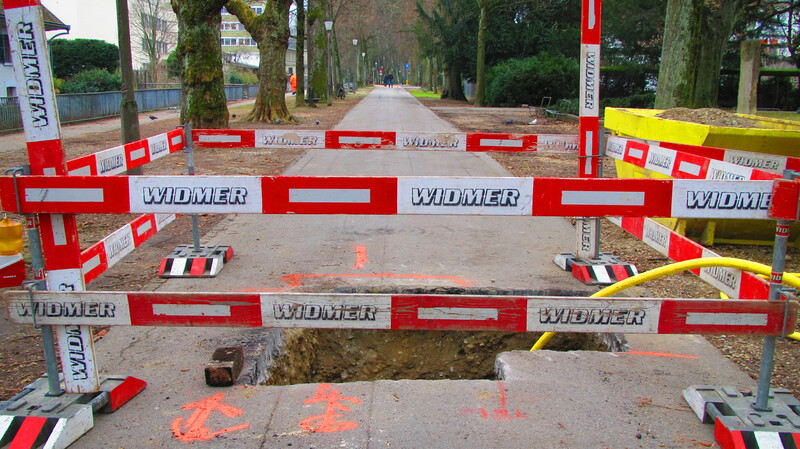 Here is the Google Translate version: As a result of a misdirection in the city of Biel (crossing road freight / Murtenstrasse) the runners of the marathon, half marathon and walking without additional round was conducted directly on the route.This lack these routes around 7.5 km distance. I don’t know yet what this means for the 100-kilometre runners, but some marathoners are going to be mighty pleased with their race times. We made up our minds where to go yesterday, but no time to write about that. We’re off to Bern and Fribourg in a few minutes. 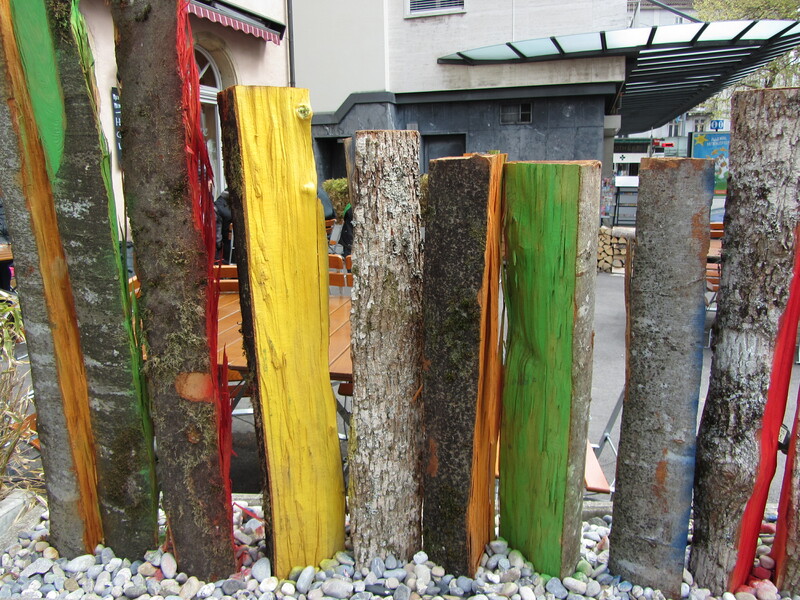 Before we go, here are some more photos from the colours at yesterday’s Biel farmer’s market. 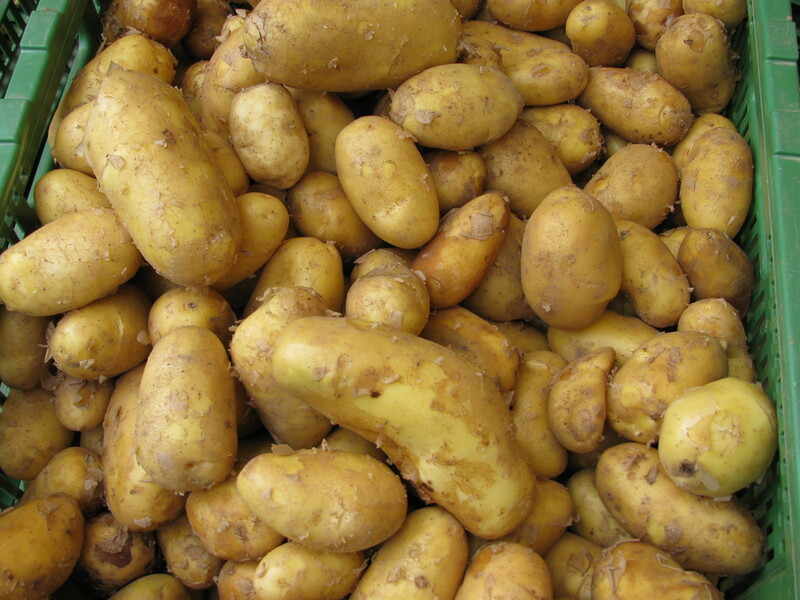 The contrary thing about the Swiss is how they support their local farmers’ markets, not out of a sense of duty or economic inbreeding, but because of an ingrained belief that no product, grown or manufactured, can best a Swiss one. I say it’s contrary because buying local food in Canada is an act whereby the buyer is making a statement about themselves, more than saying what they actually think of the product. I could be wrong about this, but also, I could be right. Consequently, in Switzerland’s stores the high-priced local Swiss strawberries (5.50 to 8.50) appear to sell out as fast as the lower priced Italian/French/Spanish ones. (2.50 to 4.50), and so it is for everything else – at least, that’s what I’m told. We haven’t visited the local farmers street market in more than a month, and it seems to have grown as summer nears. Later this week, we’ll tackle the question of whether Dave really has a job here. 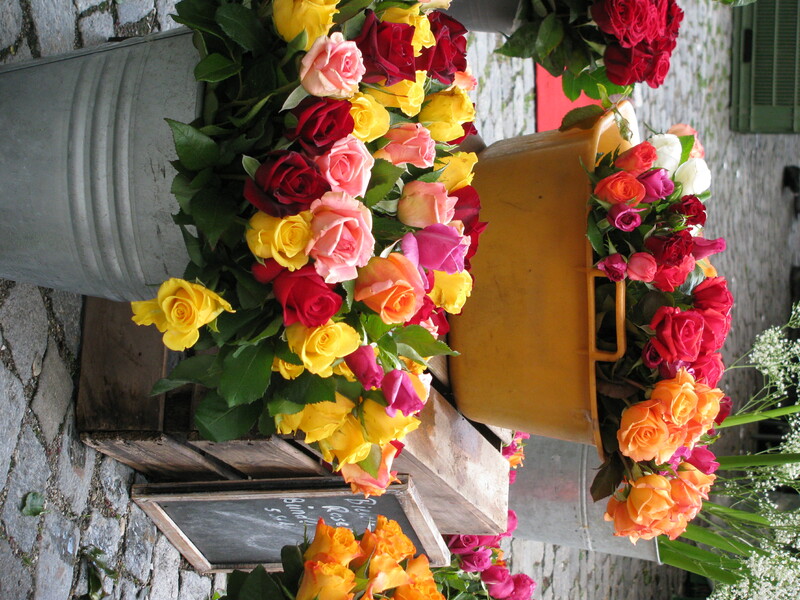 Buckets and buckets of flowers. 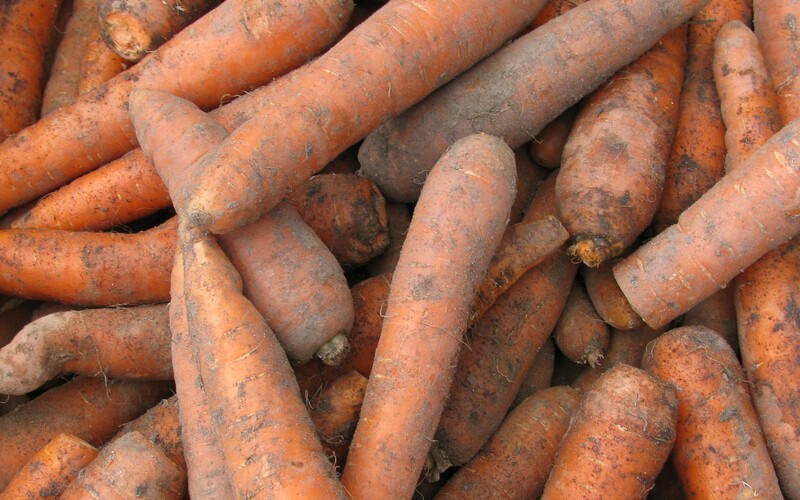 Carrots caked in Swiss dirt. I've never warmed to the idea of dining on meat left to hang out on a hot day for hours. 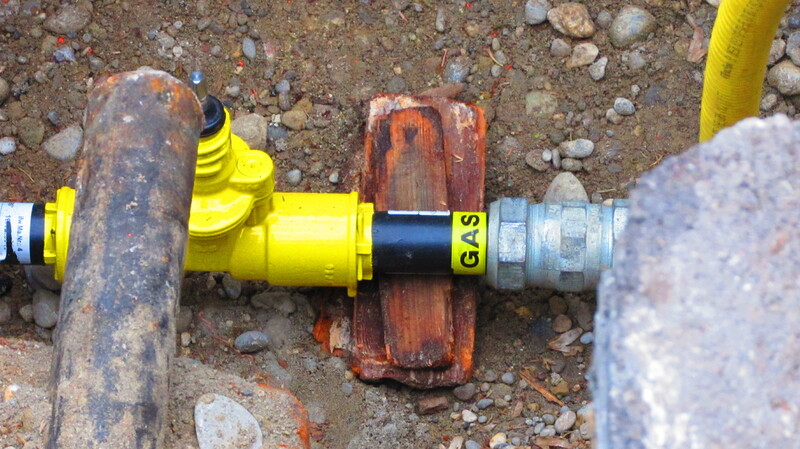 Also, what the heck is that amber coloured stuff on the right? 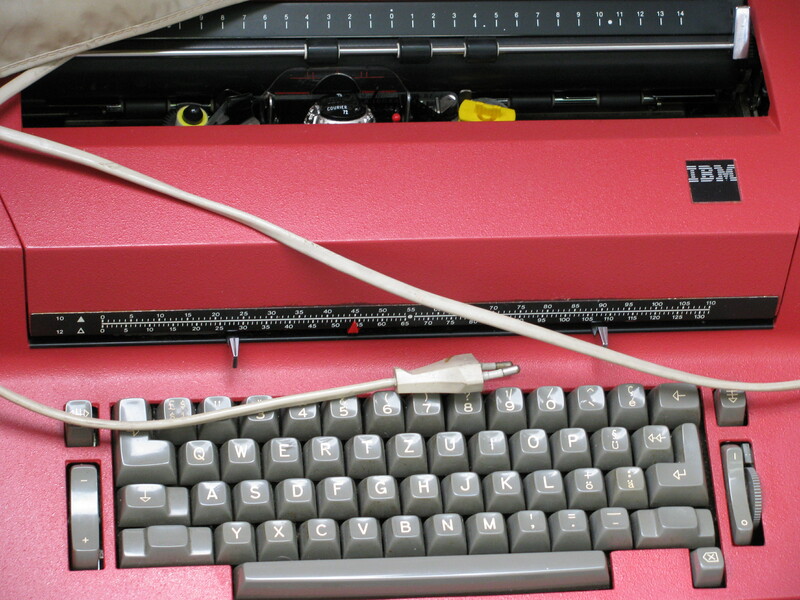 An IBM Selectric - vintage 1978, if memory serves. We saw a lot of old junk at the market, but not a lot of people buying it. 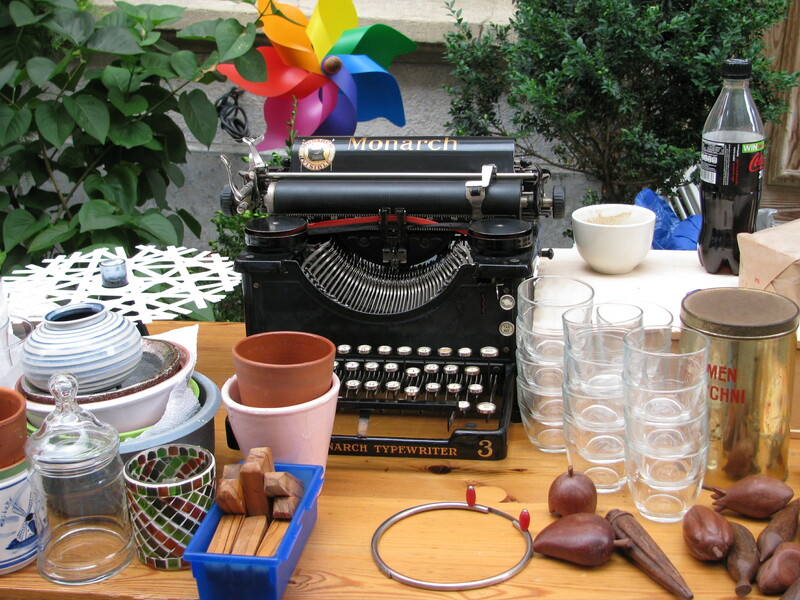 I would love to bought this Monarch typewriter with a French keyboard, but that would have gone against our "pack light" motto for our time here. 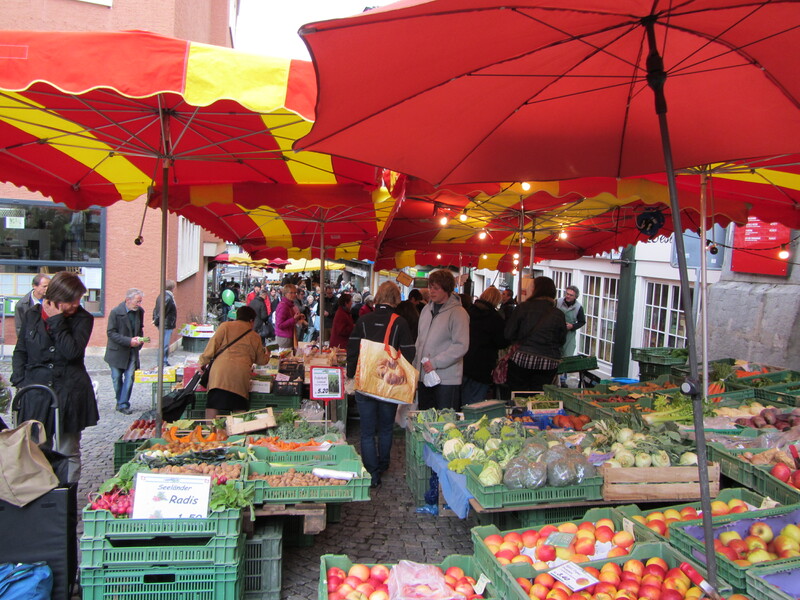 The market has expanded higher up the 16th-century cobblestone streets as summer nears. The grey metal roundish thing on the right is an old-fashioned bed heater/water bottle (for only five franks). Oooh, comfy. 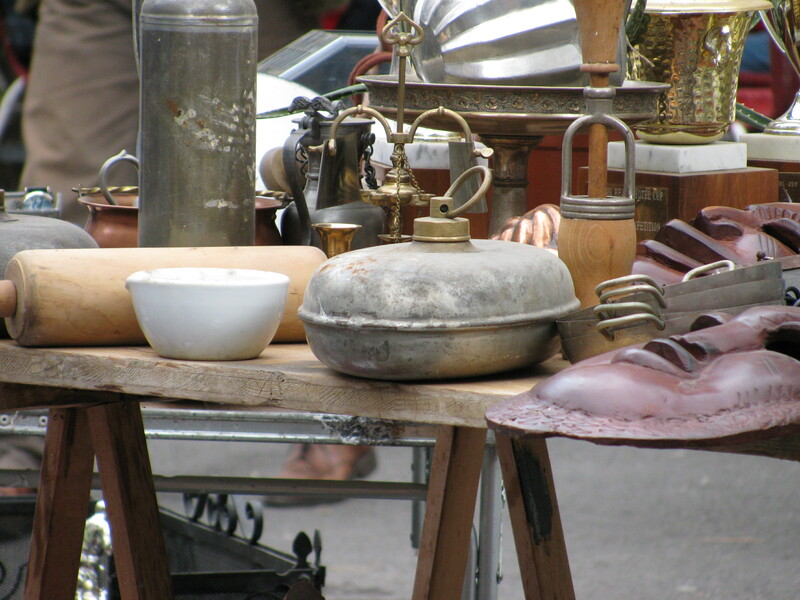 The market has many vendors selling old stuff - some looks vintage, some looks like junk. Three varieties of cherries at Biel's Saturday farm market.... they are probably all Swiss, but it is possible they allowed a few Italian or Spanish ones in. 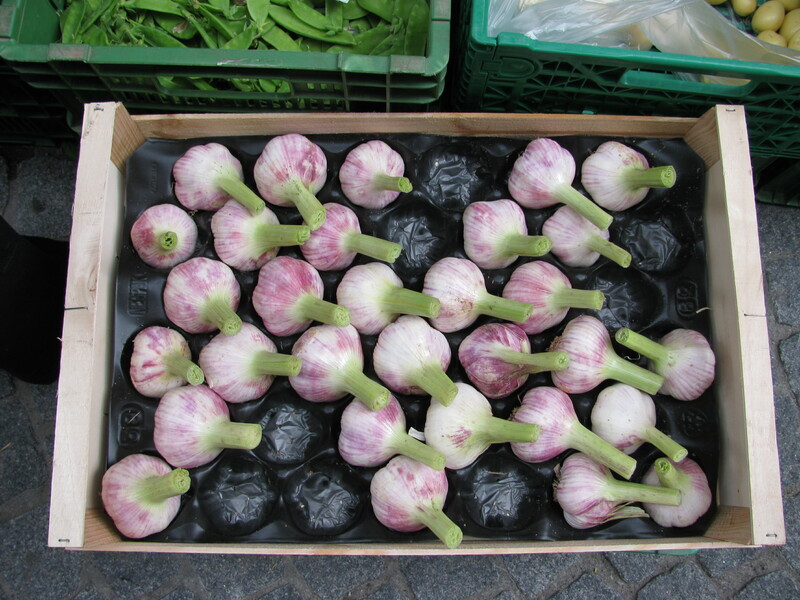 In Switzerland, the garlic knows enough to fall into formation. 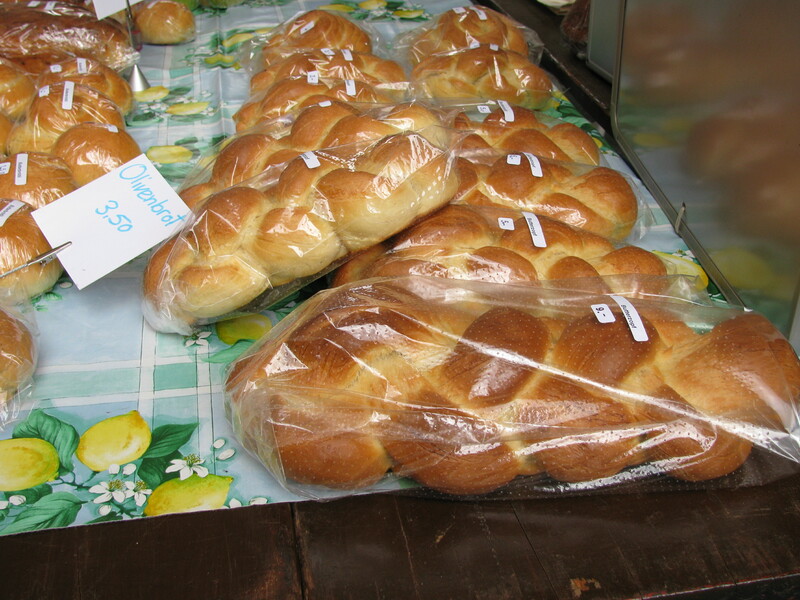 I don't know what the 3.50 is for, but we saw loaves priced at eight franks. Yikes. 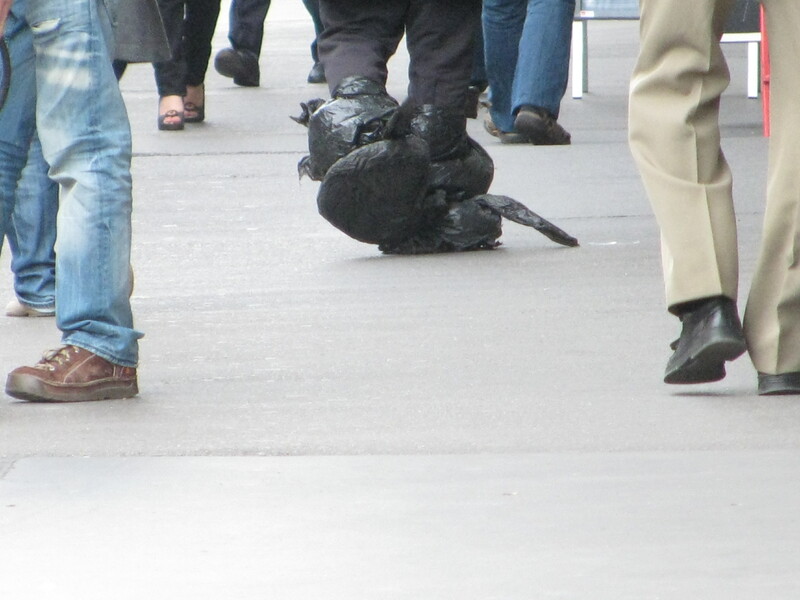 Biel homeless man has worn garbage-bag shoes for the past two weeks, even in the blistering heat. 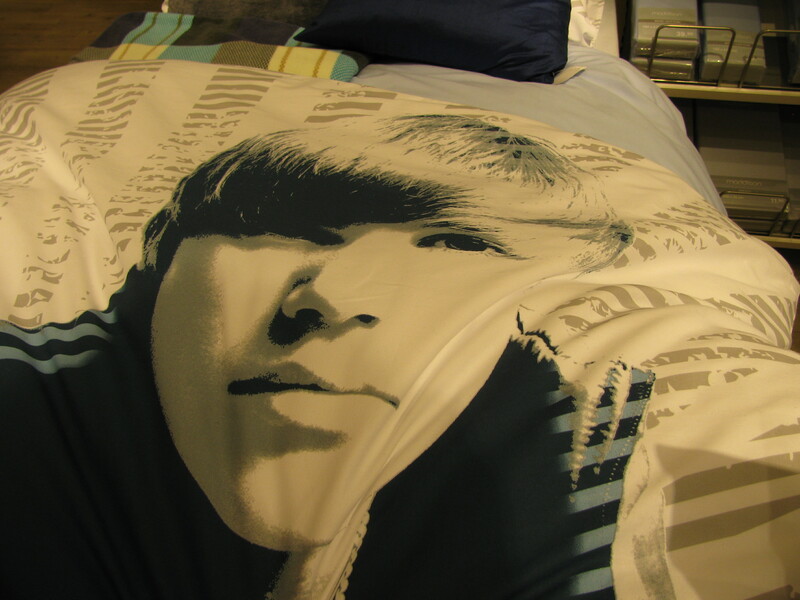 Justin Bieber images are everywhere, such as on this junior sheet set at a local department store. His visage outnumbers that of Obama, Clinton (either one), Michael Jackson, the Beatles and anyone running in Canadas current federal election. Elders favour canes over walkers. 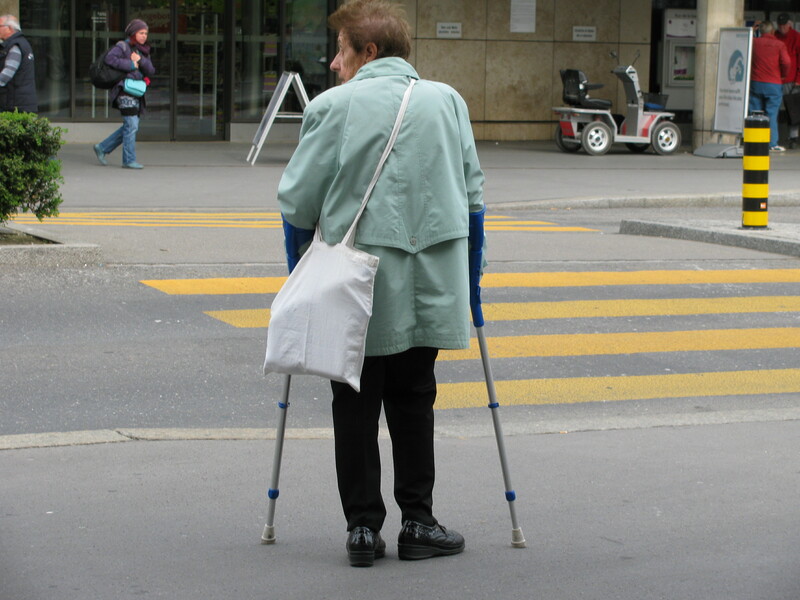 Even young people sport these arm-brace-style canes, making us wonder if polio races through the Swiss. They park, and occasionally drive, on sidewalks.... not as often as the Spanish, but a lot more than North Americans. 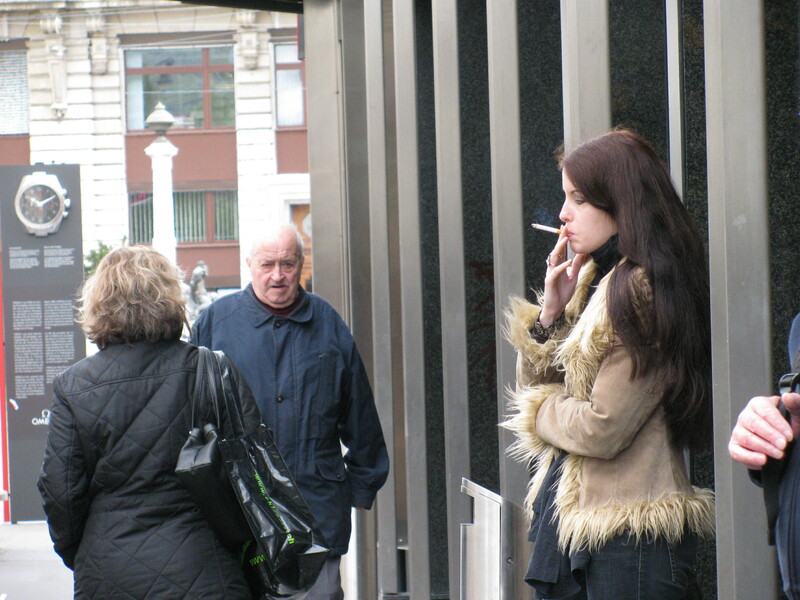 One in four smoke, according to Switzerlands Federal Health Office. In both Canada and the U.S., one in five smoke. 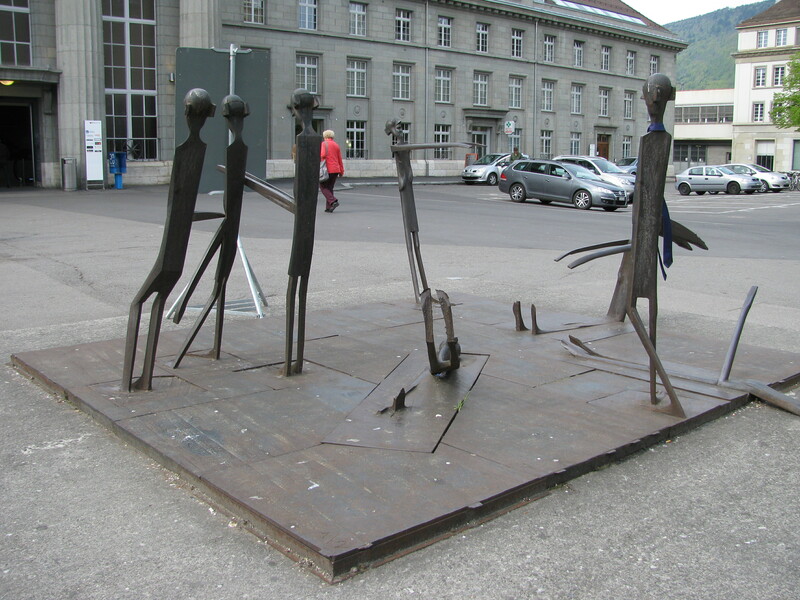 Despite the 25 per cent rate given by the Swiss government, the number of smokers looks higher on the street where the Swiss smoke as they walk, juggle babies, lounge in street cafes. Smoke is blowing into our suite as I write this as my Italian neighbour takes to the balcony for her morning fix. Despite their reputation for attention to detail, their take on public art would make North American insurers and art/park commission managers gasp. 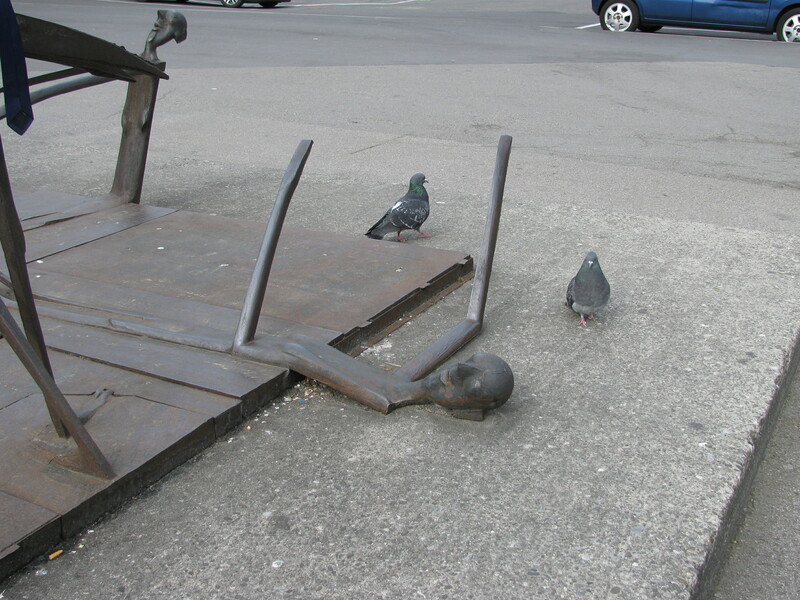 These wrought-iron statues could inflict fatal wounds if someone tripped into one. Note: Dave does not let me twirl anywhere near these. Just in case you dont quite see it: The arms on this prone statue are about two inches thick and maybe two feet long - would plunge through a chest wall or eye socket quite easily. Eeeew.